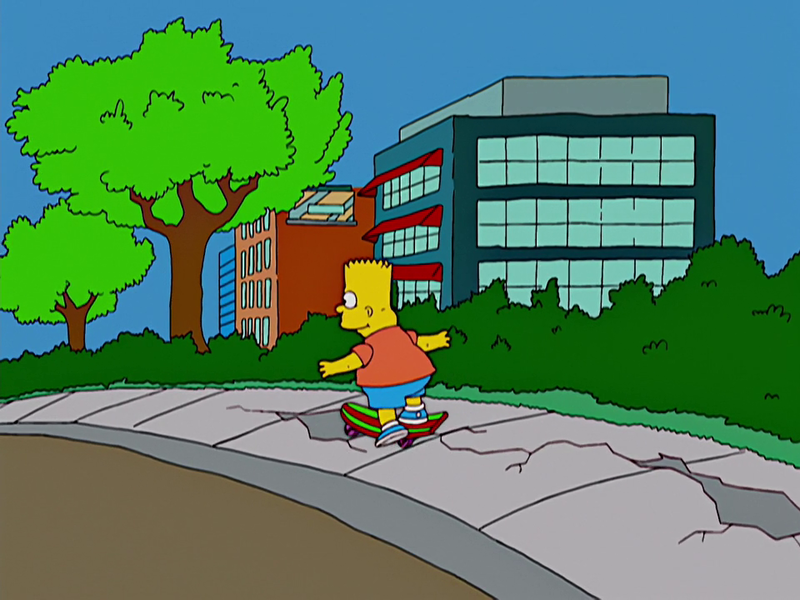 The Opening sequence is one of the most notable hallmarks of The Simpsons. 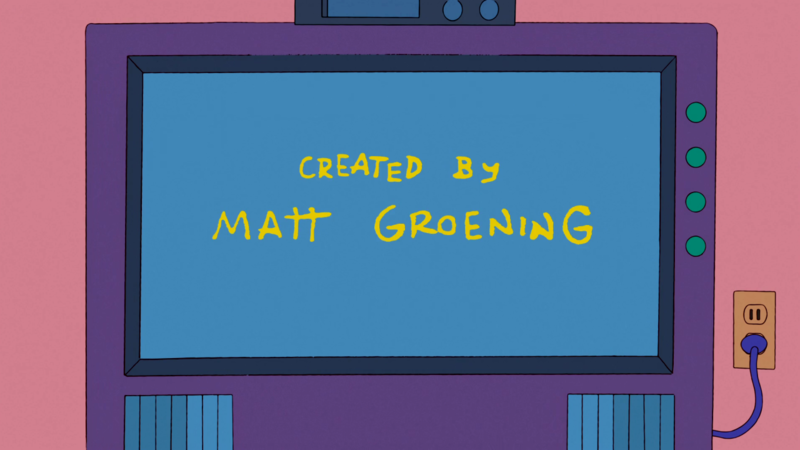 Each episode opening differs from episode to episode, usually with a different Chalkboard Gag, Couch gag, Saxophone Solo, and Billboard gag (post Season 19). 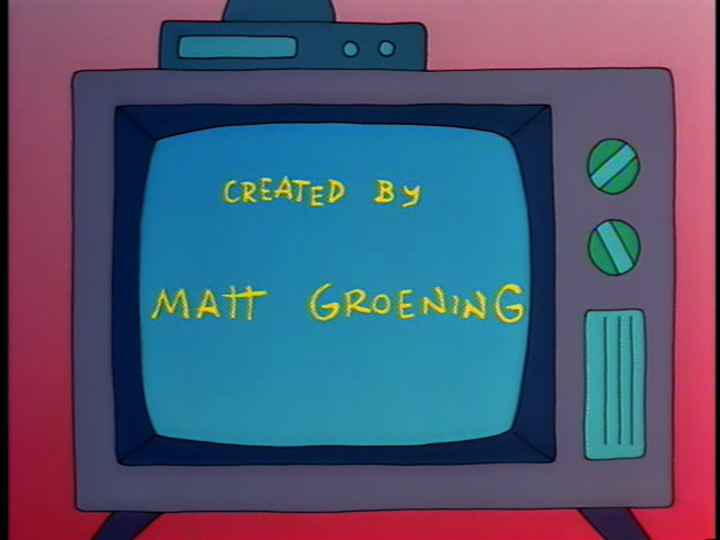 The sequence once again opens with the show's title zooming in on the camera. But this time, the sky has a much brighter blue color, with several cumulus clouds which part, as the text appears. Flying through the loop, we focus on one purple cooling tower. 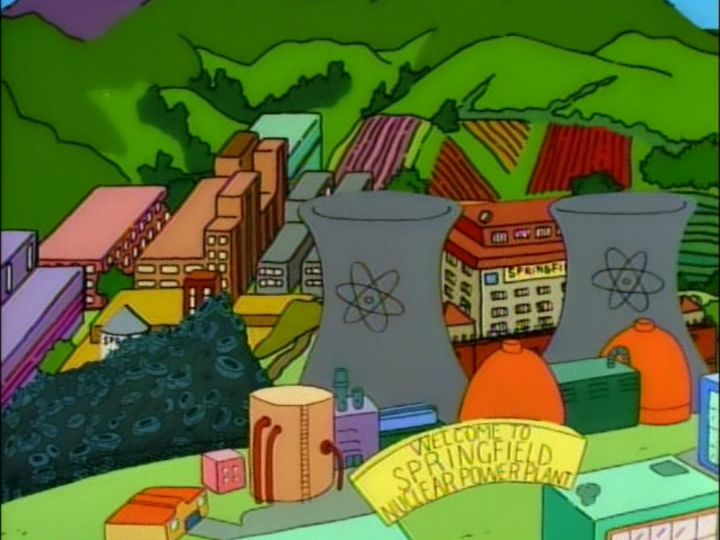 We see the power plant, welcome sign, and Springfield Prison behind the plant. 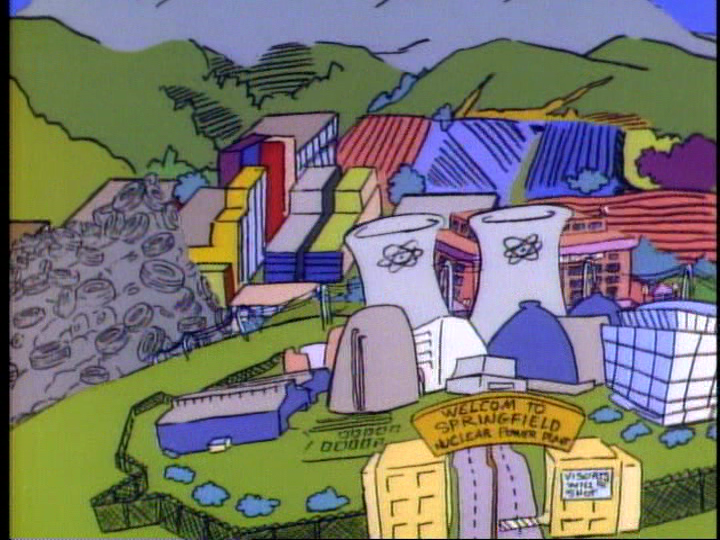 We fly over the power plant and tire yard, toward downtown Springfield. 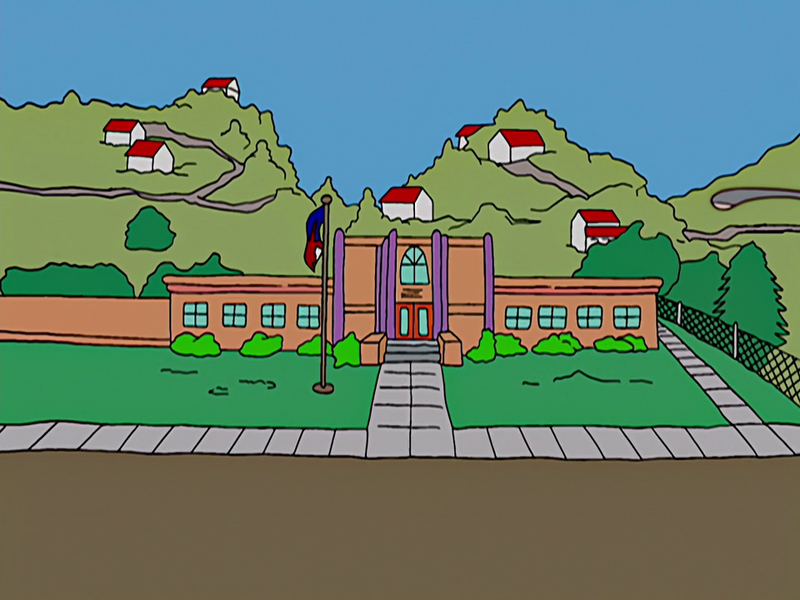 "Painless Dentistry" is replaced with "Candy Dandy" as we move towards the Springfield Elementary School, which is now orange with purple accents instead of lavender. 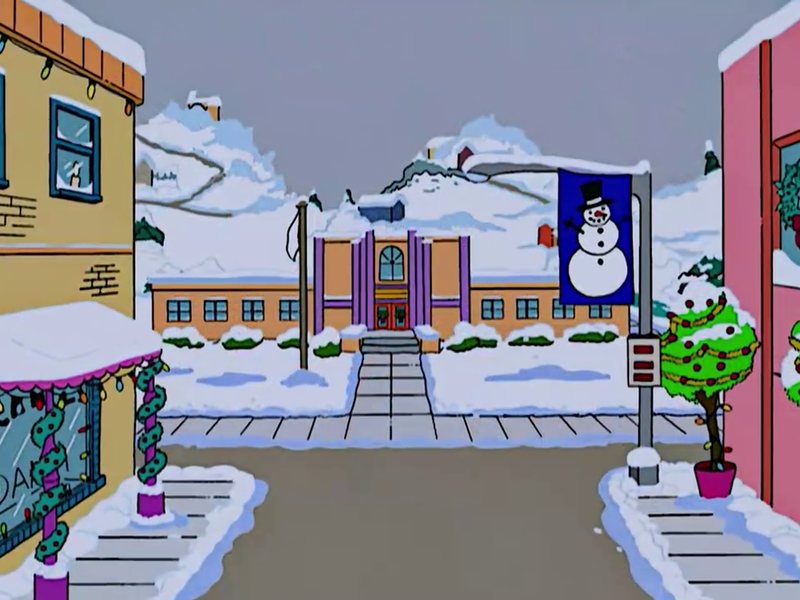 The infamous streetlamp glitch happens as we move toward the school—it snaps violently to the right (this is only in a handful of episodes in seasons 2-20). 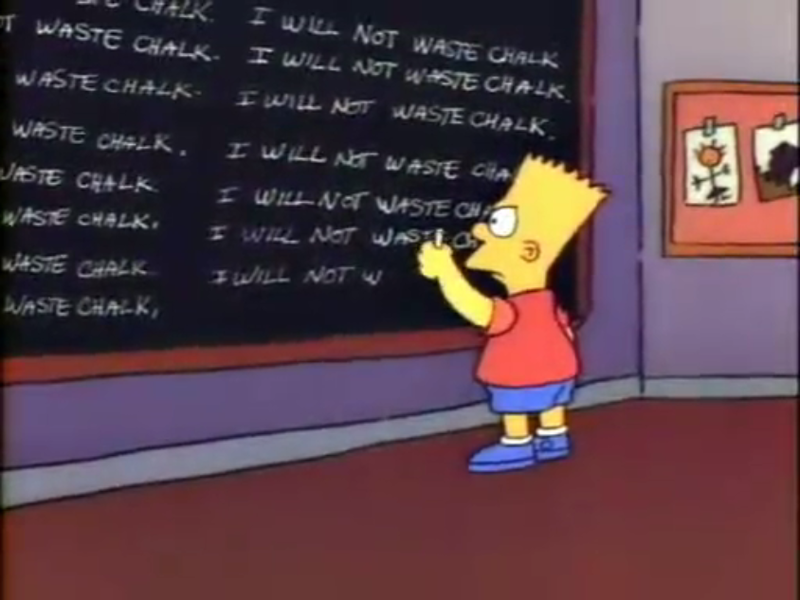 The sequence of Bart writing the Chalkboard Gag is also redone. 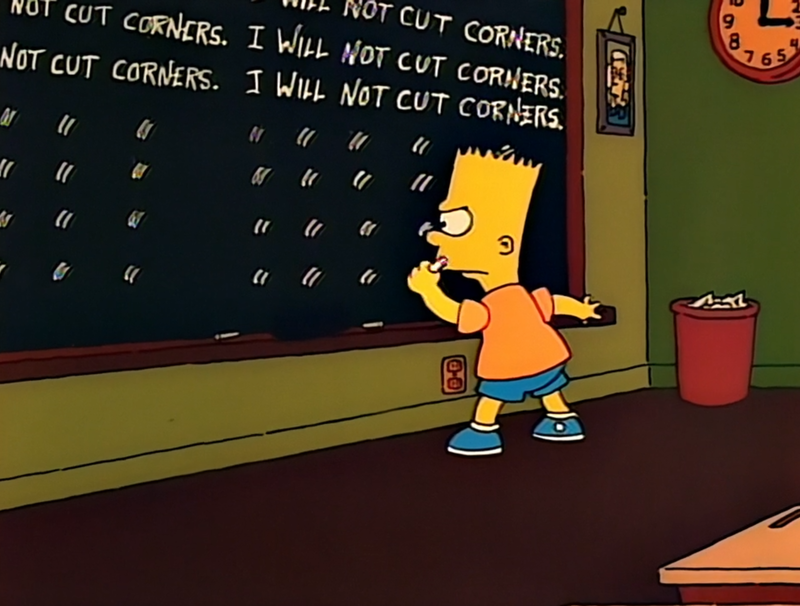 The walls are now dark-green and Bart's chalk does not squeak in later episodes of the second season and beyond. 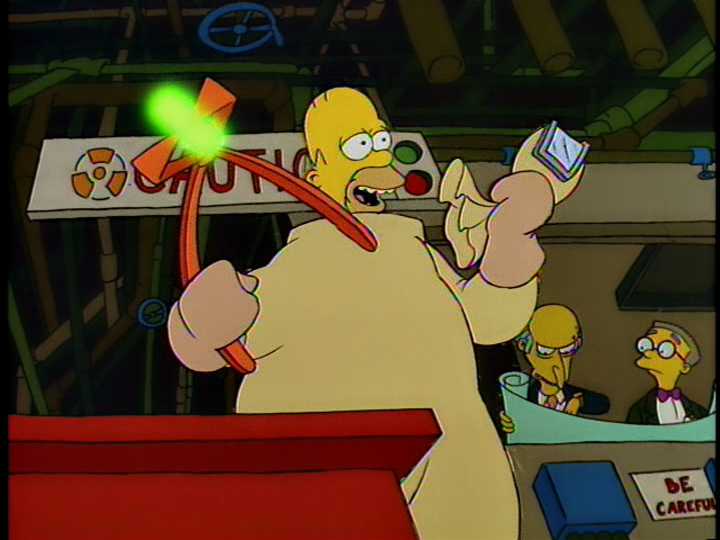 (NOTE: The final use of the chalk squeaking was in the episode "Homer Defined".) 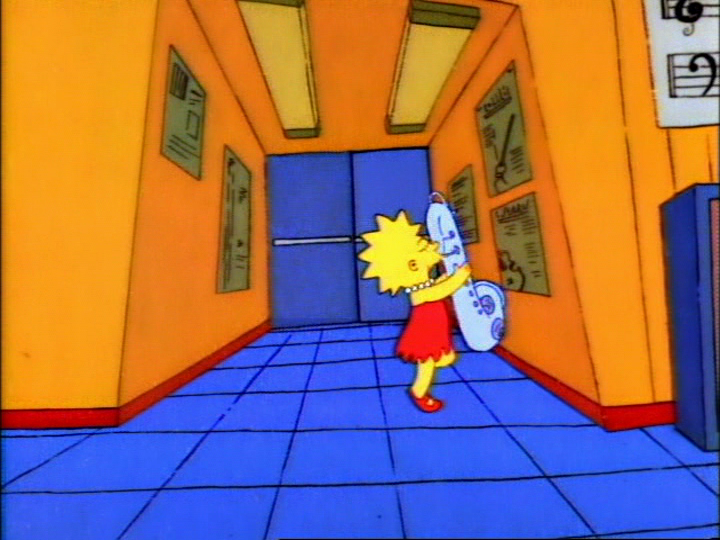 There is a clock showing 3:00 PM, and a wastebasket stands to Bart's right. A portrait hangs on the right side of the blackboard, and bookcase full of books sits behind him. 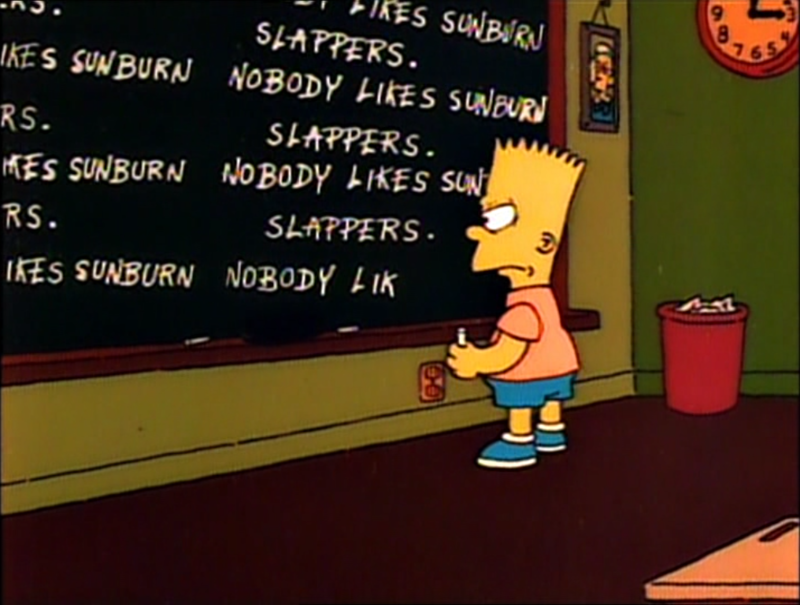 Bart stops writing for a second and glares at the chalkboard. 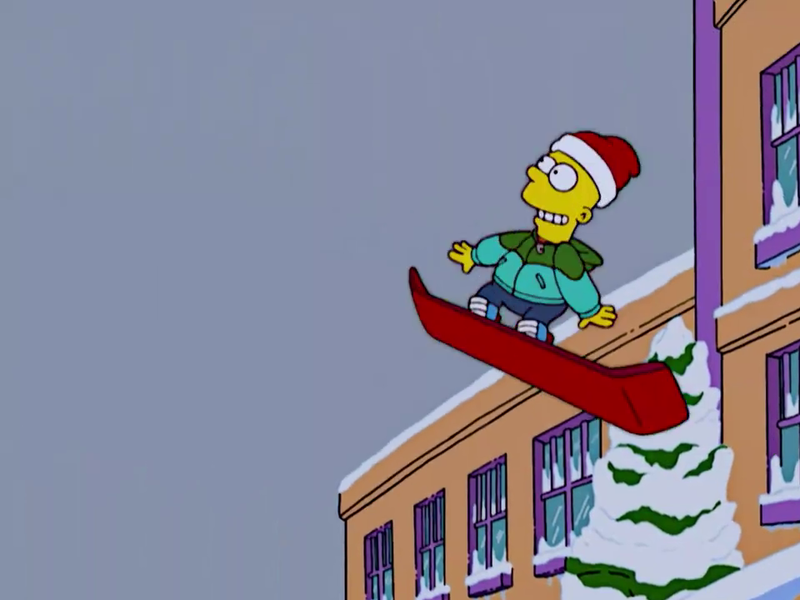 When the bell rings, he grins, runs out of the classroom, and skates out of the school, flying gleefully past the flagpole. 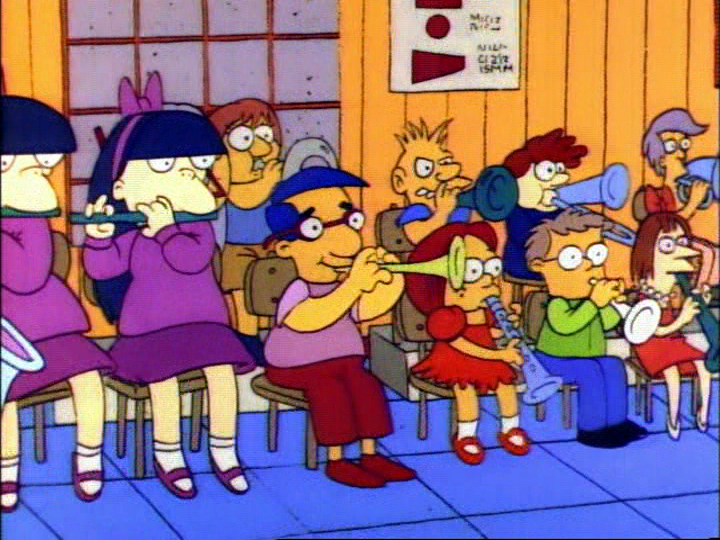 (NOTE: The episode "Little Orphan Millie" has Bart laughing as he runs out of the classroom.) 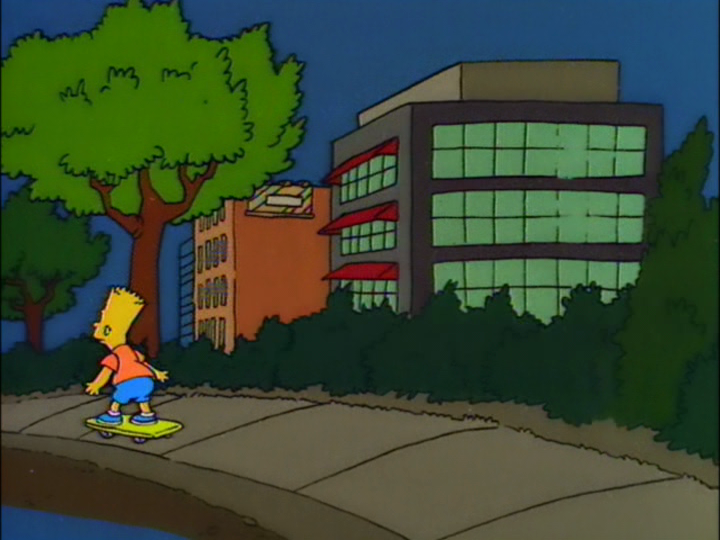 Bart also passes a three-story glass and concrete building, a four-story orange building, and some trees and bushes. 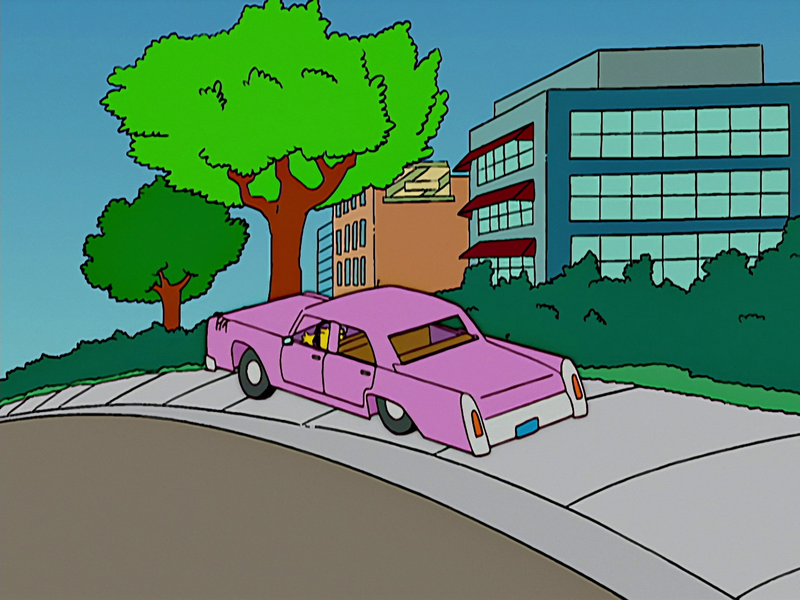 The animation used during this scene is much smoother and the perspective problem is solved. 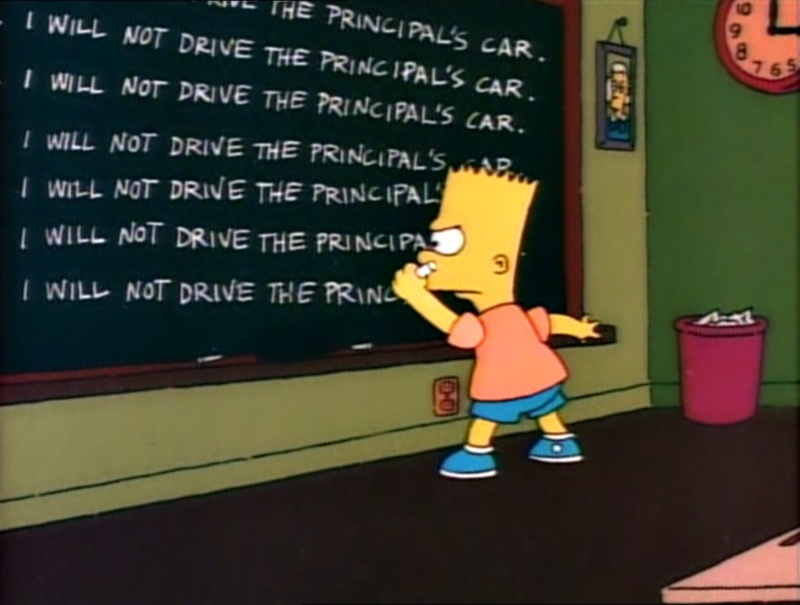 (NOTE: In "Barting Over", when the camera shifts to its sight at the school, part of the end credits music is playing until Bart runs out of the classroom, after chopping the chalkboard an axe.) 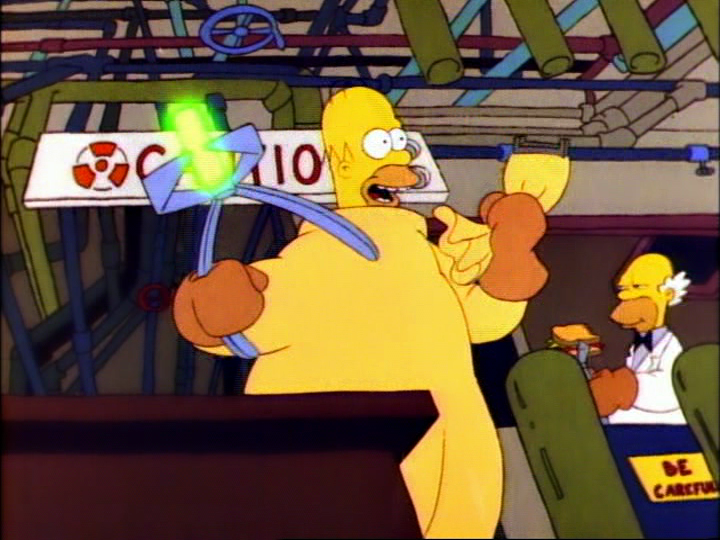 The next shot shows Homer leaving the power plant, with the small uranium bar stuck on his back. 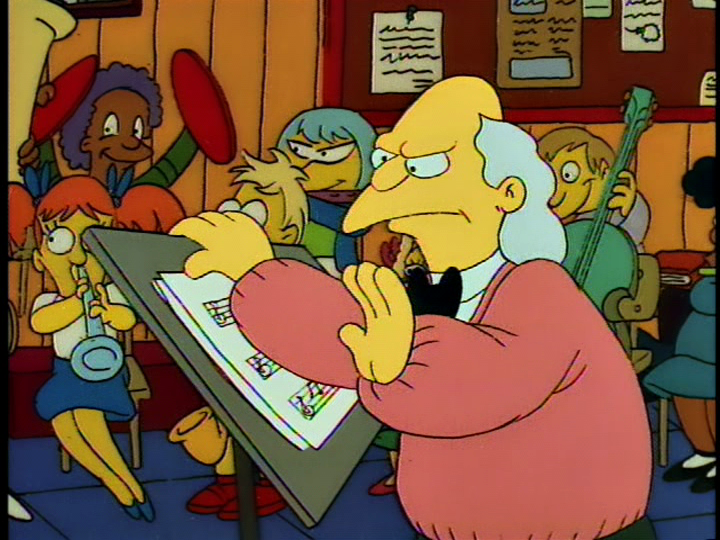 In this scene, the bald man is replaced with Mr. Burns and Smithers, looking at a layout plan when the end-of-shift whistle blows. 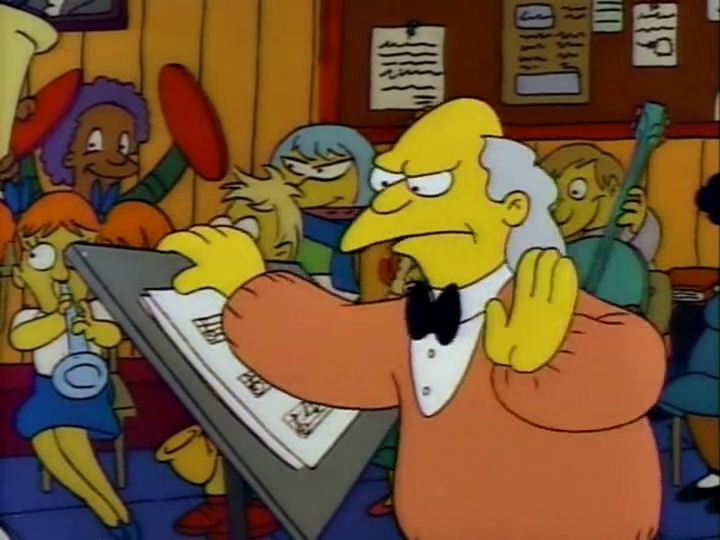 Mr. Burns puts his watch up to his ear and shakes it, as if he believes it has stopped. 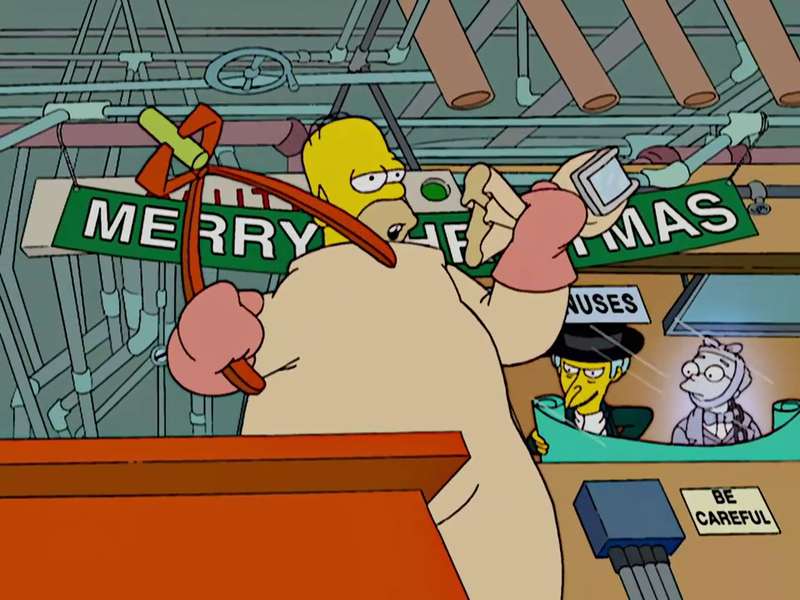 The caution sign over Homer's head has a green light on top, and a red light on the bottom. 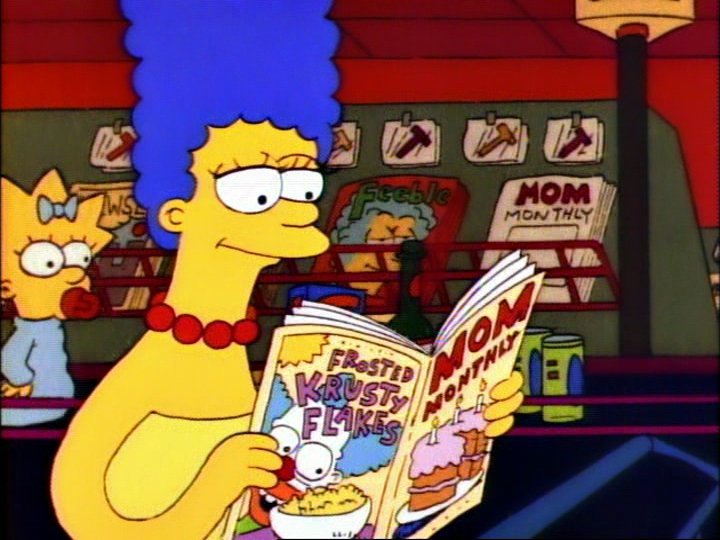 It then goes to the Grocery store, where Marge is reading the "Mom Monthly" magazine. 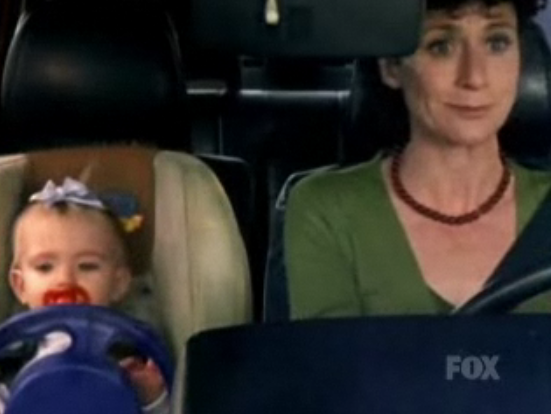 The background is more orange than red, as in the first season opening sequence. Maggie's hands are also now straight on her side rather than put in triangle position and as she is checked out the cash register flashes $847.63. 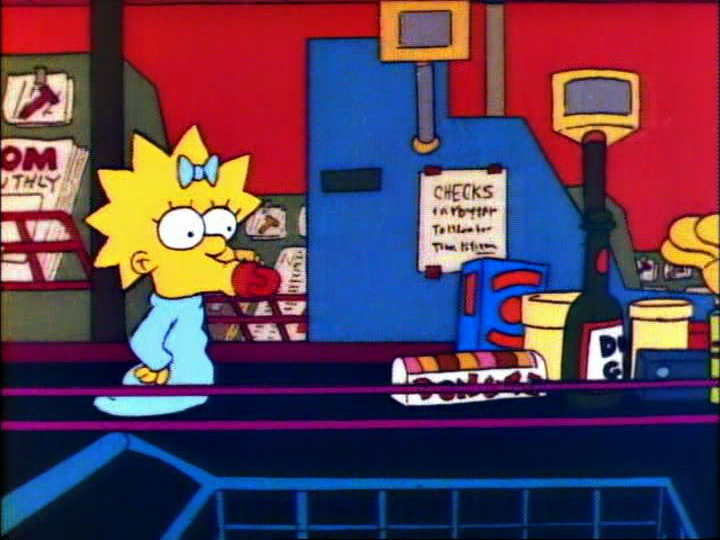 (NOTE: Some episodes like "Barting Over" had more sounds of the cash register in the background as the other items, before Maggie are checked out.) 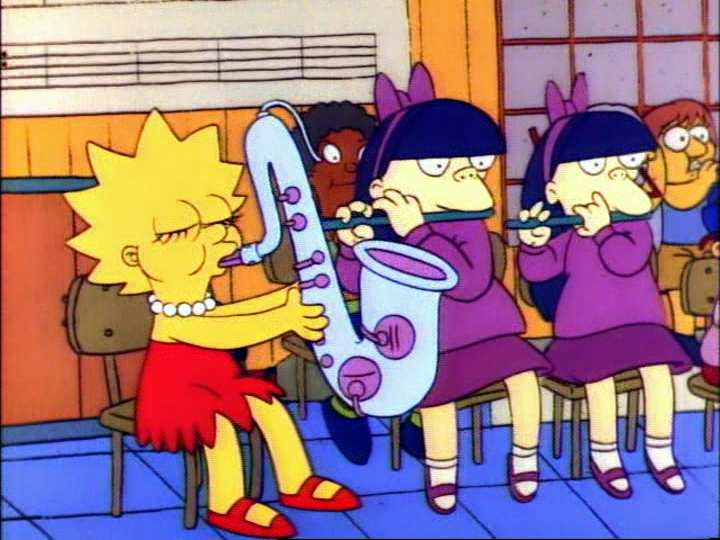 Back at the school, Lisa is shown at band rehearsal, with a slightly deeper sax solo (either the Simpsons theme or a different tune). 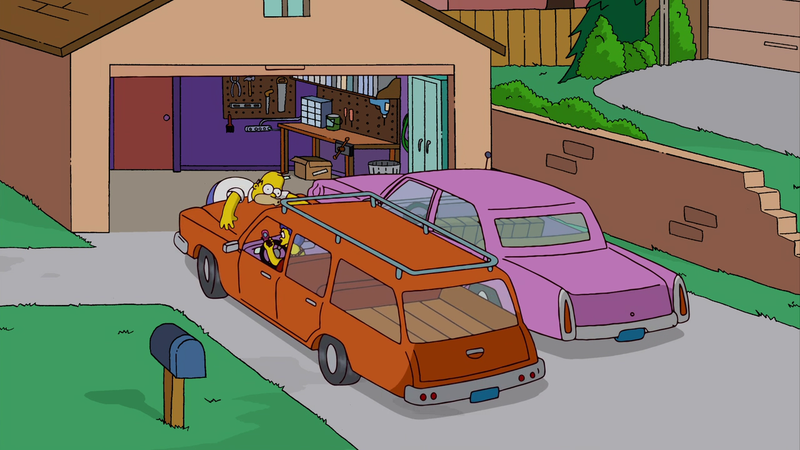 The Simpsons all arrive home at the same time. 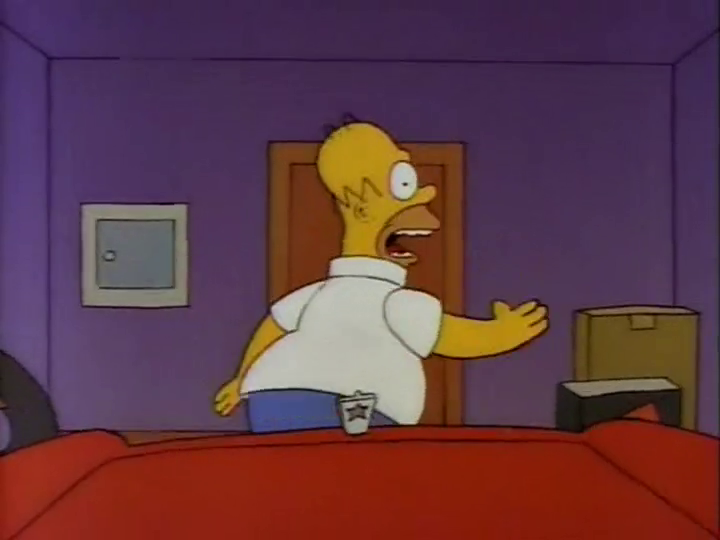 This time there is oil stain, and Homer arrives home first. 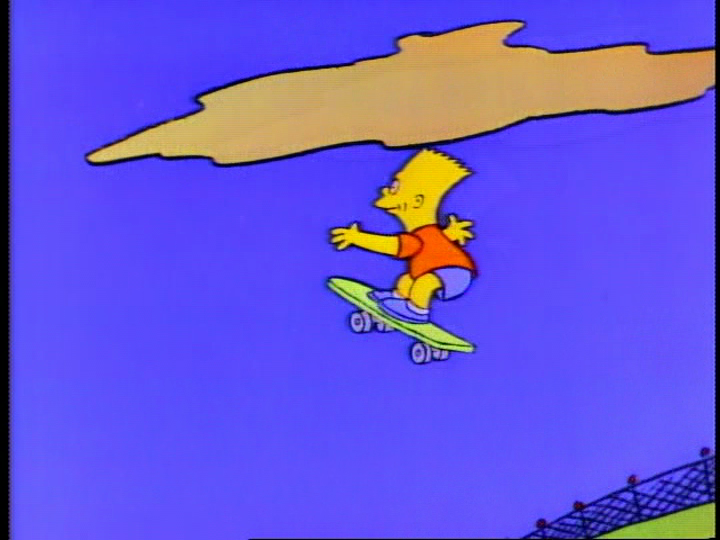 Also, after Bart lands on the car roof with his skateboard, the garage door opens and Homer gets out glaring at Bart, slamming the door. 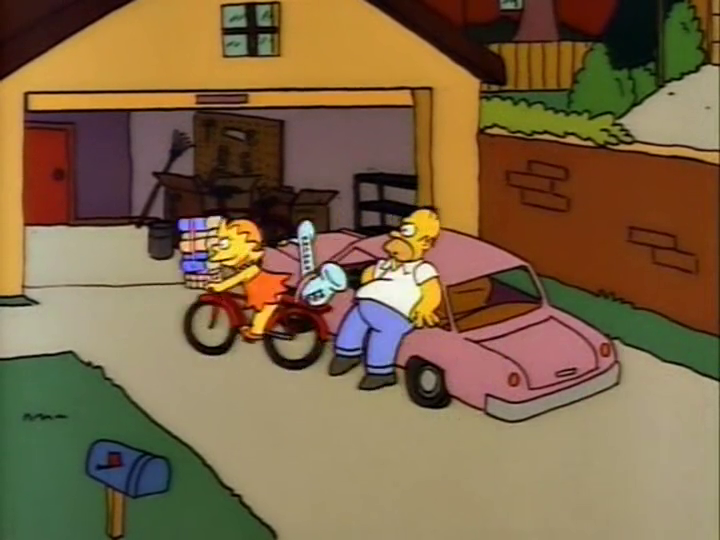 He quickly dodges Lisa on her bike and yells, "D'oh! 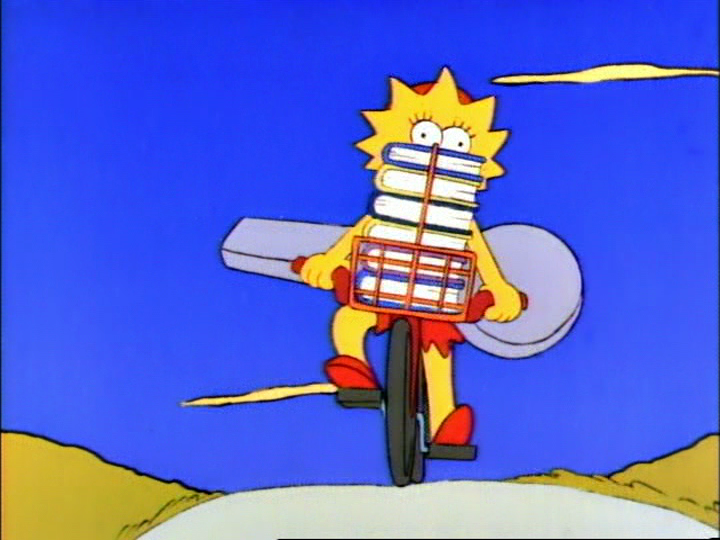 ", as she takes her bike up to the front door. 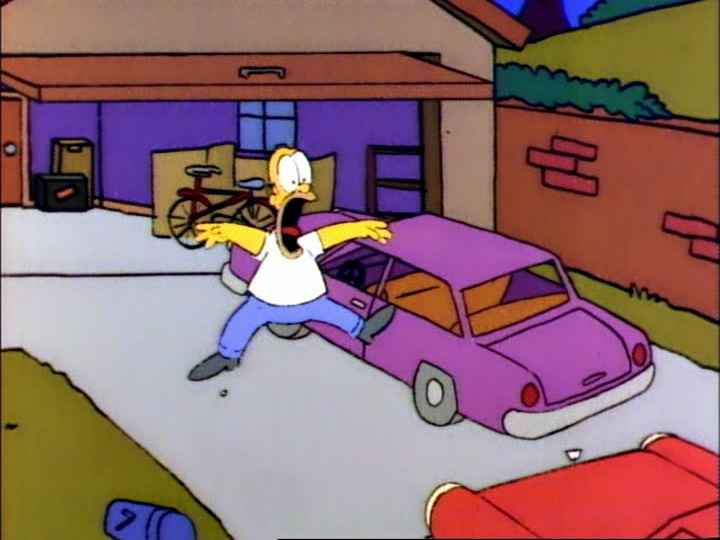 He steps back out and screams as Marge's car approaches. 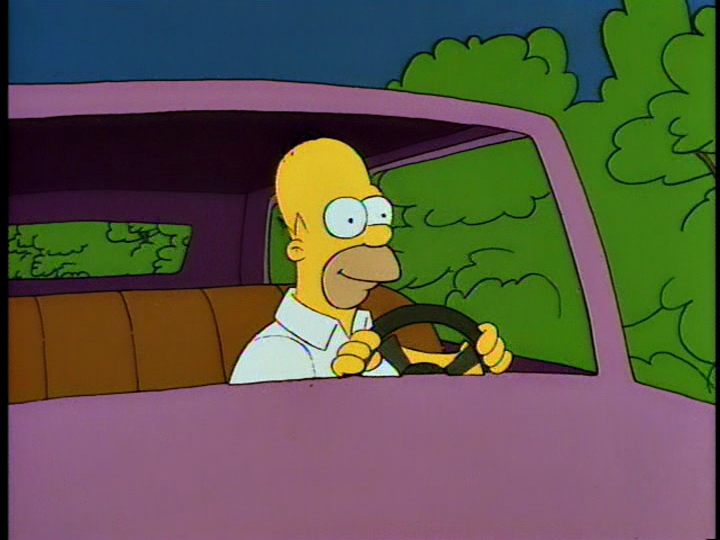 He looks over his left shoulder, then his right as he runs into the garage. 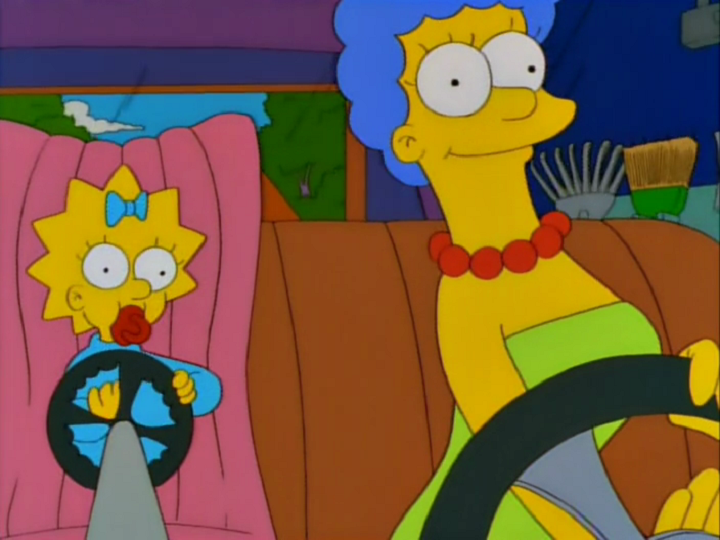 (NOTE: During Marge's view, the car still happens to be red from the first season.) 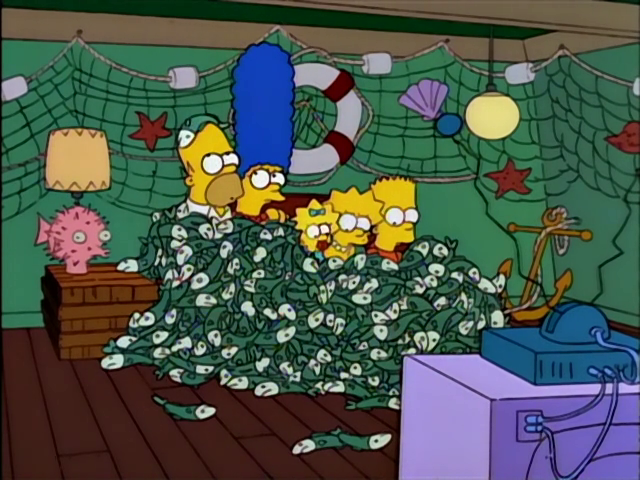 This is followed by the Couch Gag. In the living room, the rabbit ears are more sophisticated and the painting is a crooked sailboat pic. The TV set is blueish purple. Dials on right of set: two on top, blue speaker below, on top of the TV a VCR and rabbit ears on top. 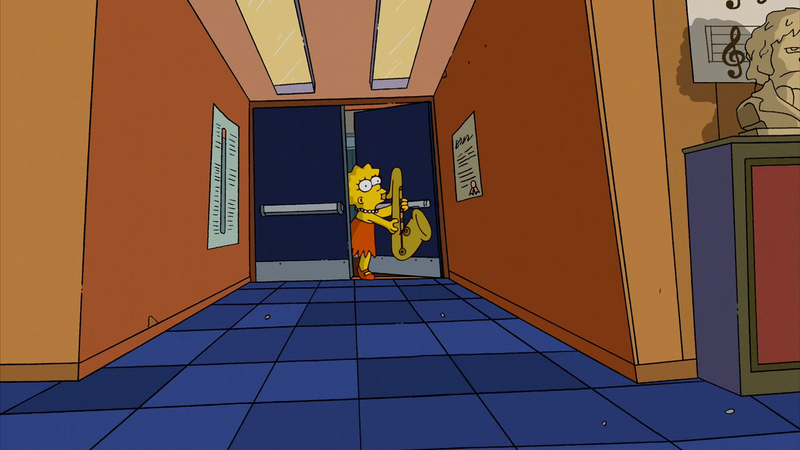 The original prototype version of this opening, as used on Season Two episodes, had the music slightly similar to the first season music. 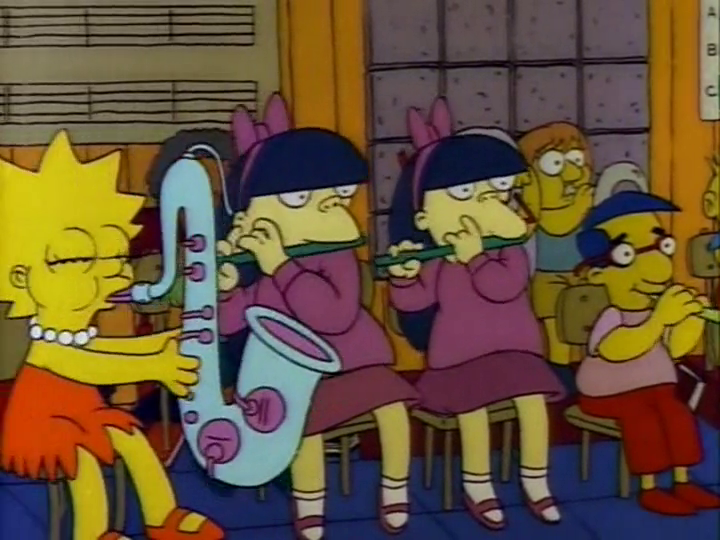 Homer's scream is more high-pitched and the school band performs a slightly distorted version of the theme. 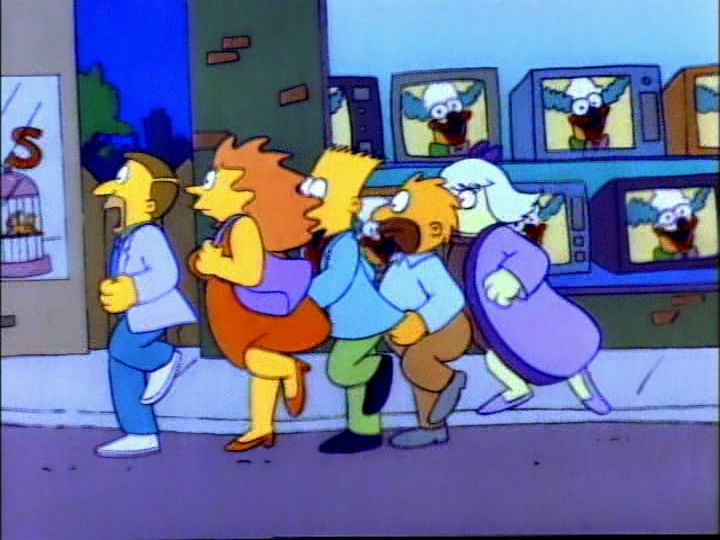 The TV set's legs are also visible at the end. 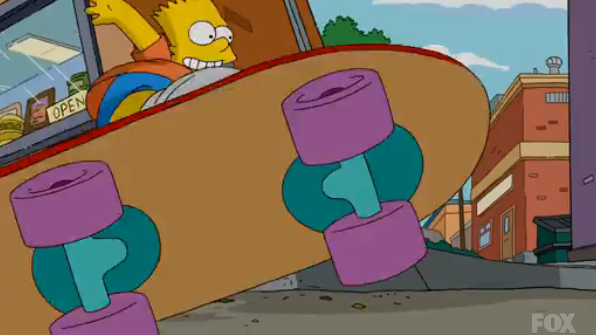 In "Bart Gets an "F"", the colors are darker and brighter. 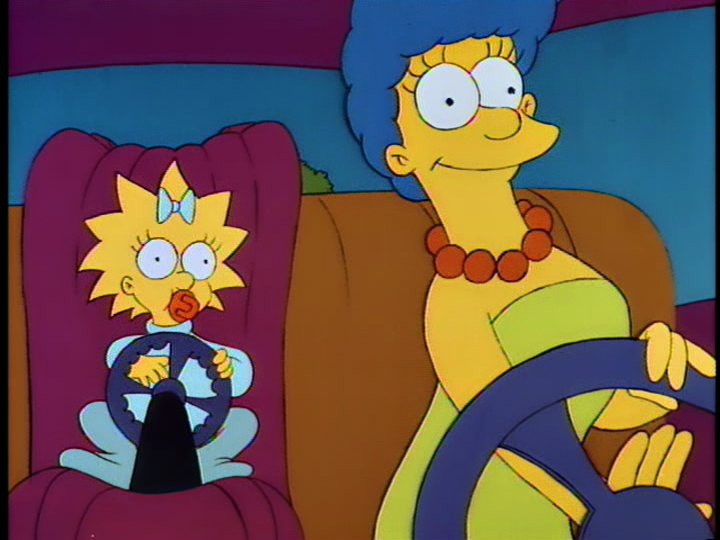 During the rest of the show (until Season 20), starting with "Simpson and Delilah", the colors remained the same, except for the music and Bart's chalkboard gag, which was constantly using high color saturation. 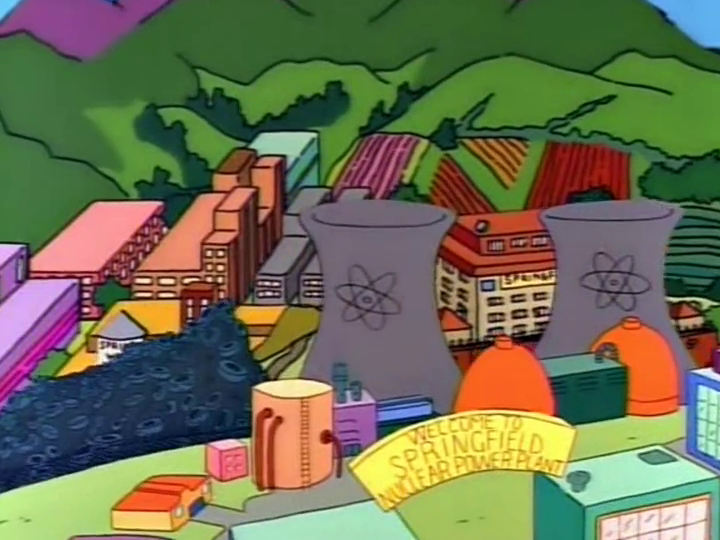 This would not change, until "When Flanders Failed" of Season 3. Later, the episode, Saturdays of Thunder would introduce the full version of the current theme music (outside of the US). 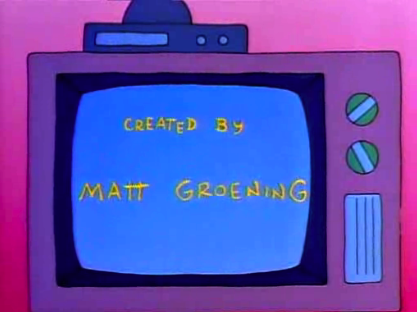 Starting with this opening, there have been shorter versions. 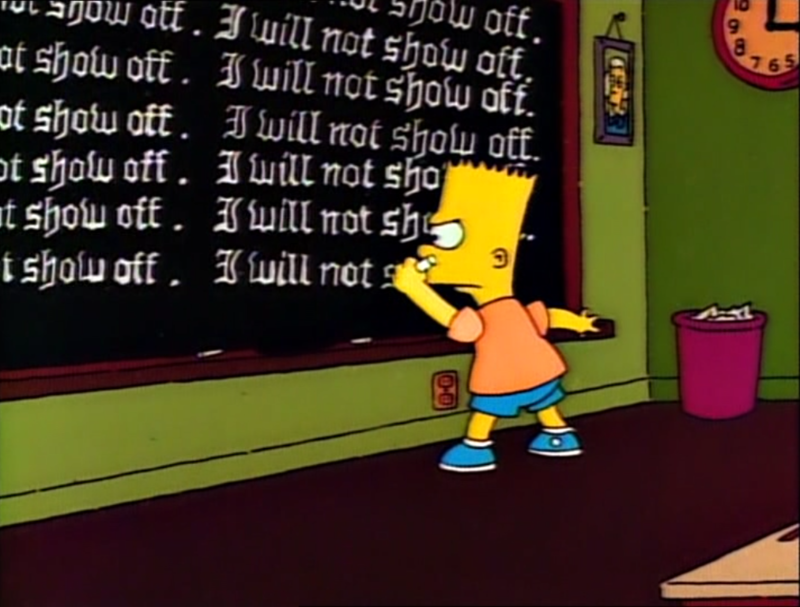 On "One Fish, Two Fish, Blowfish, Blue Fish", the camera goes from the "P" of the title card to the classroom with Bart's chalkboard gag. 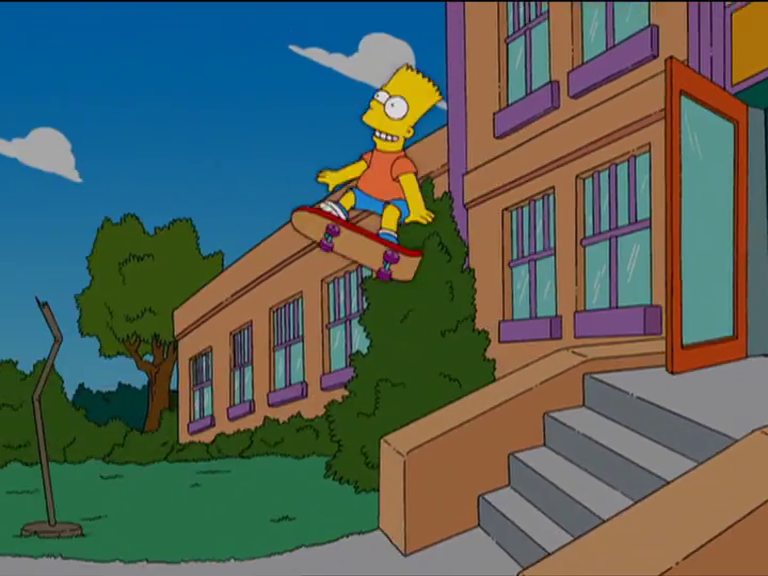 After the bell rings, the scene shifts to Homer at the Power Plant, thus skipping Bart skating out of the front doors of the school. 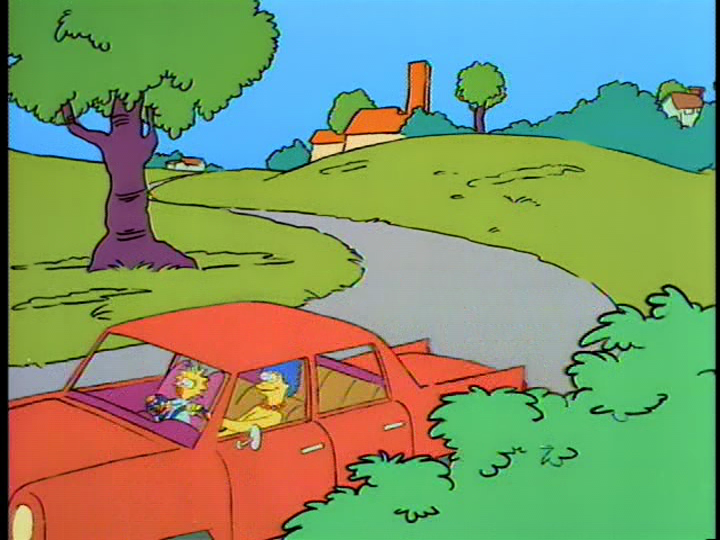 After Lisa's sax solo, the scene goes straight to the driveway, where Homer pulls in. 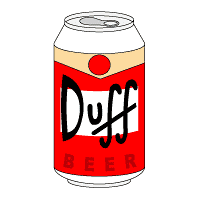 This was often shown on Season Three episodes. 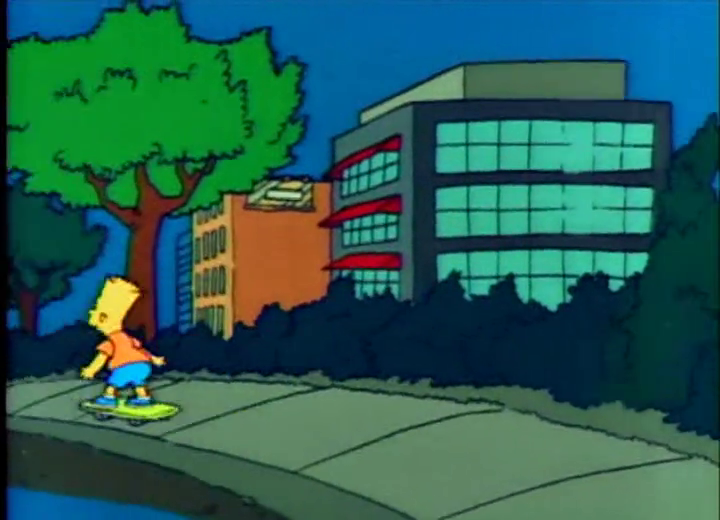 (NOTE: On the full versions of the opening, when Bart begins to run out of the classroom, the camera immediately pans out of the window of the school. 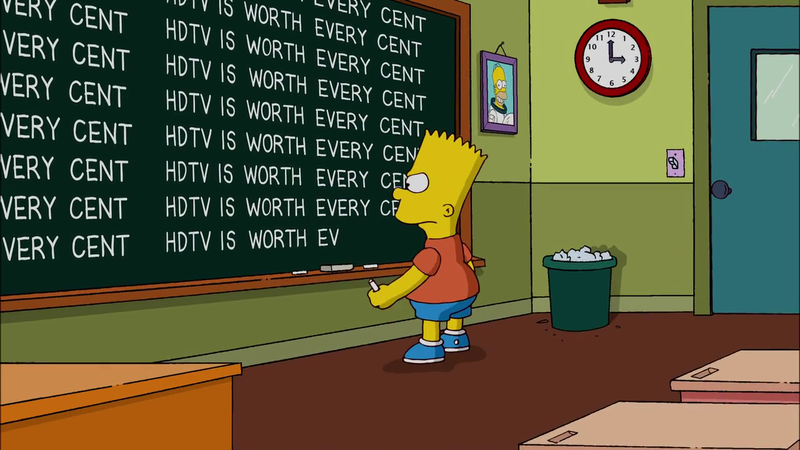 However, when Bart runs out, the camera stays in the classroom, before it cuts to Homer.) 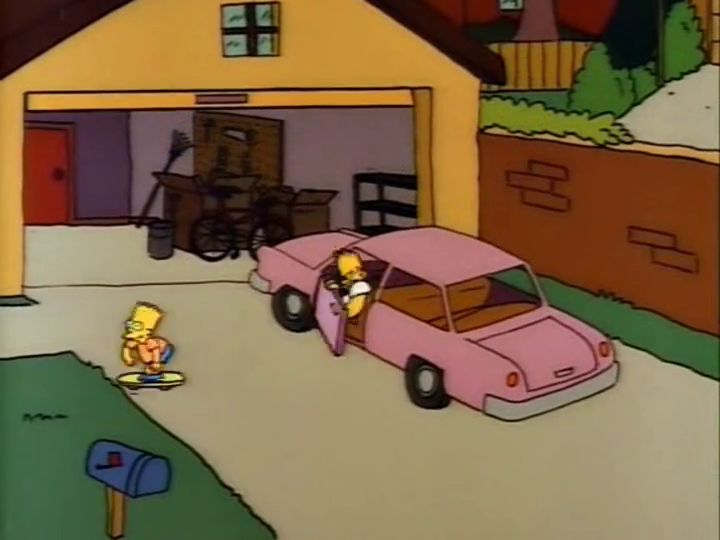 On "Lisa's Substitute", the camera goes from the "P" to the driveway scene. 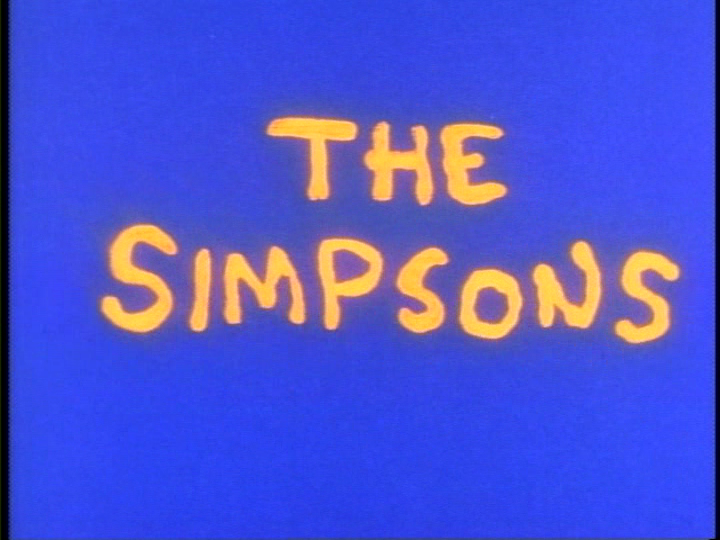 This version, the shortest of them all, was used on a jumble of episodes and the reruns of the episodes with the longer openings. 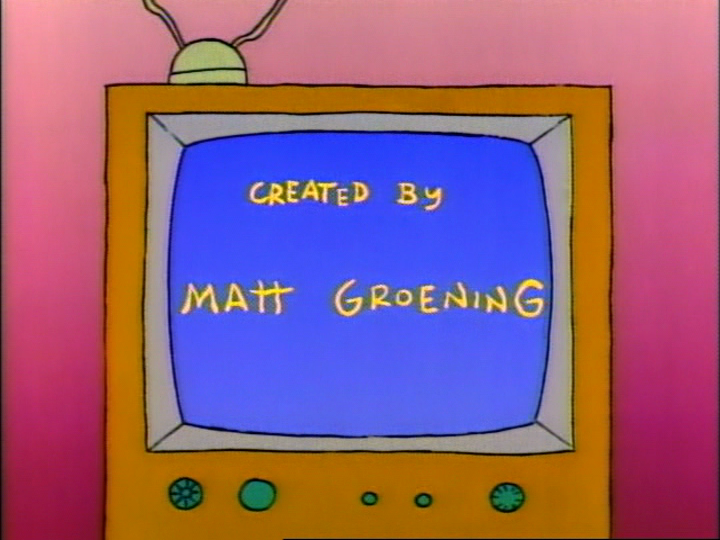 On "$pringfield (Or, How I Learned to Stop Worrying and Love Legalized Gambling)", the opening is almost the same as the first short version, beginning with the opening going through the "P" of the title card to Bart's classroom. 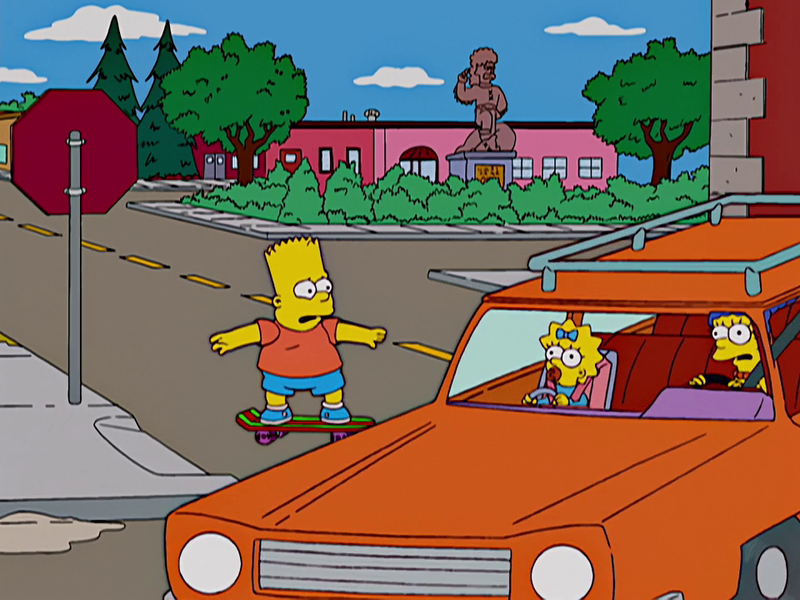 However, this version goes from Bart running out of the classroom to the Driveway scene. 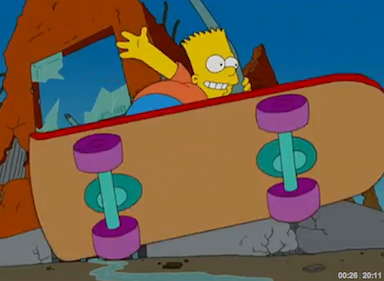 This was often shown on almost all of the seventh season episodes. 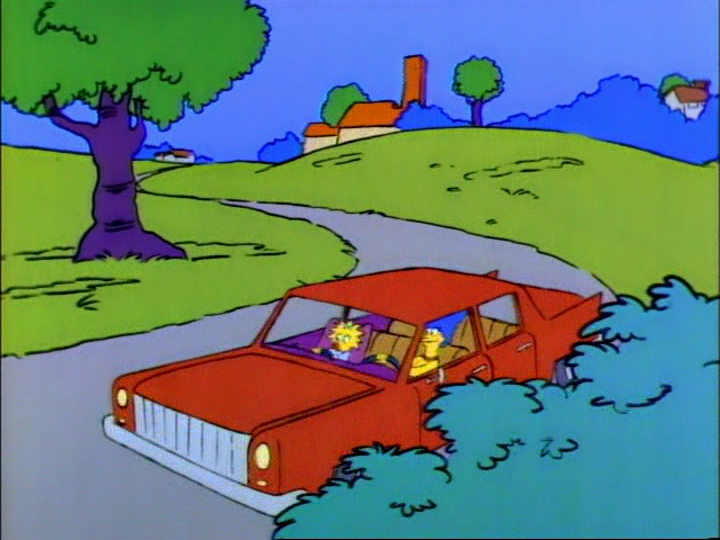 A shorter version, as shown on "The Sweetest Apu", has the scene shift from Bart exiting the classroom to Marge's view of Homer running from the car and into the house. 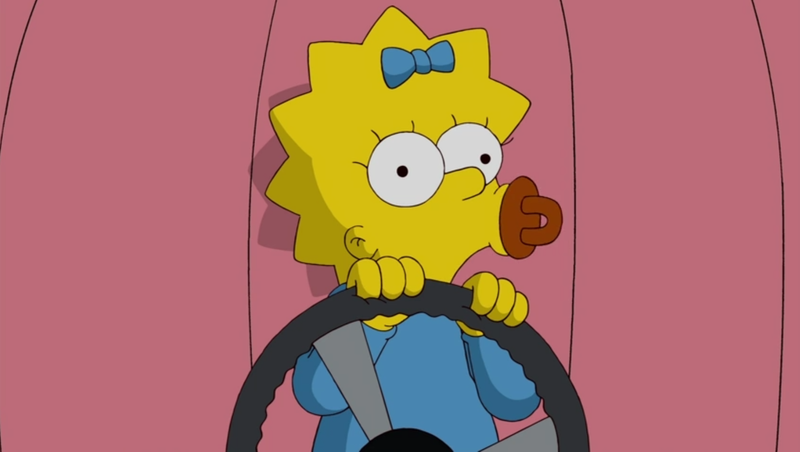 On "Barting Over", the opening cuts from Lisa's sax solo to Maggie driving. 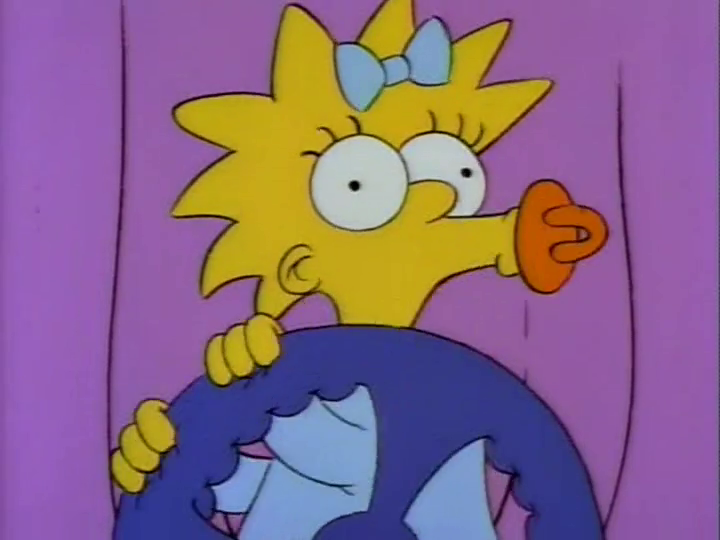 On "Homer's Paternity Coot", the opening shortens the car sequence. 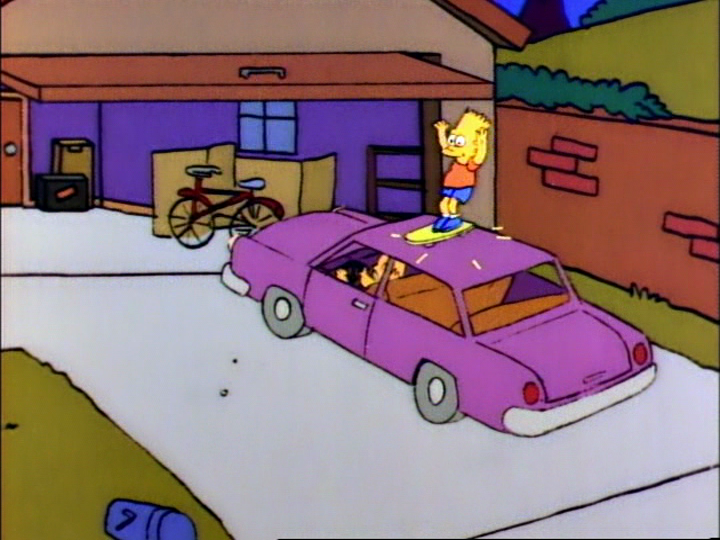 On "Million-Dollar Abie", the opening goes from Lisa's sax solo to the driveway scene. On "G.I. 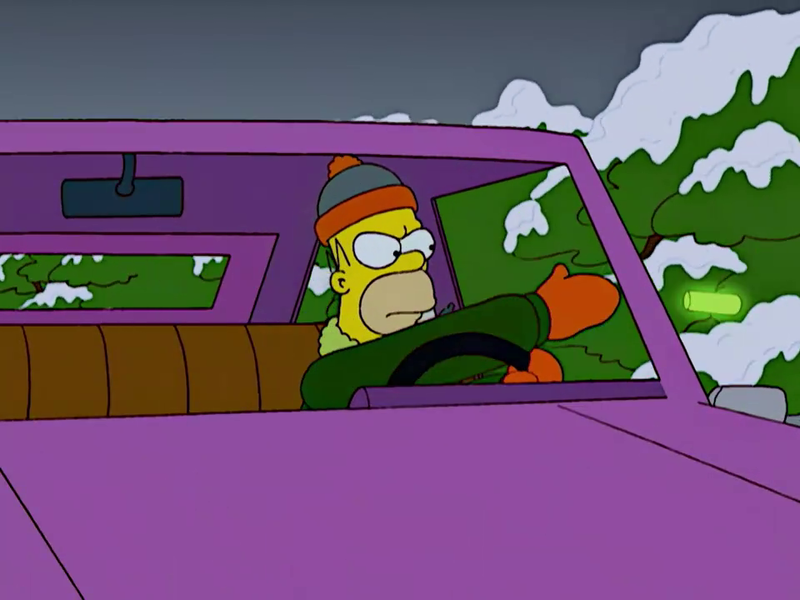 (Annoyed Grunt)", the opening skips the first part of the driveway and starts with Homer screaming and dodging Marge's car. 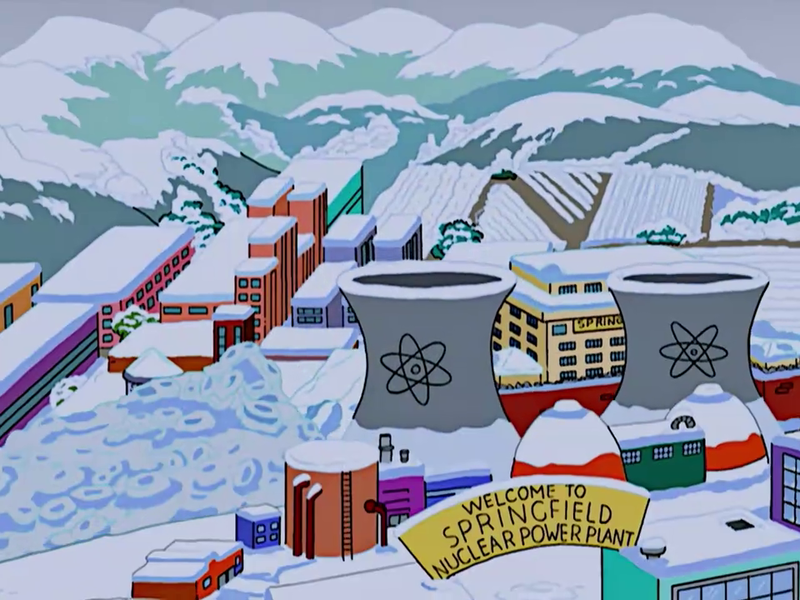 On "The Simpsons 138th Episode Spectacular", the opening is much like the seventh season opening, except that there is a different shot of the clouds, the town swoop across town is shown (with a modified text), and there are a mix of couch gags from 8F18, 9F02, 9F10, 9F09, 8F09, 1F02, 2F31, 2F09, 2F06, 1F17, 2F11, and 9F08, as the full version of the theme song continues to play. 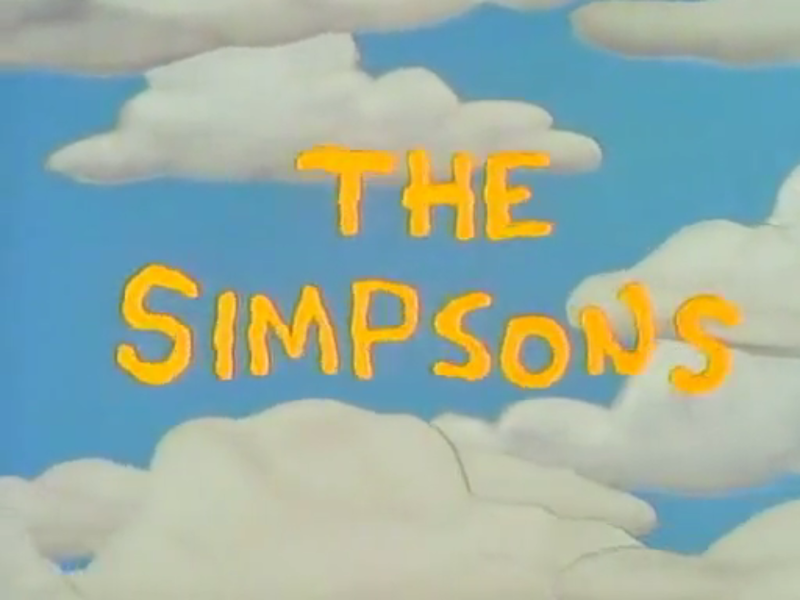 This new HD sequence opens with the show's title zooming in on the camera while moving forwards through cumulus clouds. A crow with three eyes passes by as the chorus sing the title. 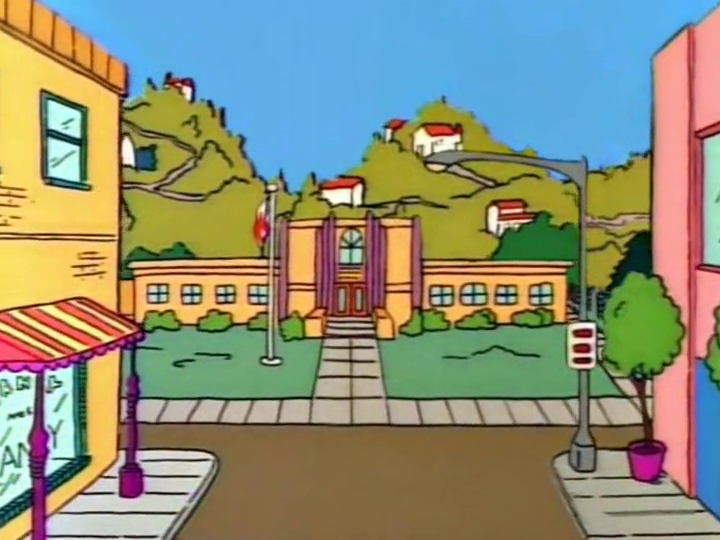 It continues to zoom in on the town where Jimbo Jones and Kearney Zzyzwicz saw off the head of the Jebediah Springfield statue in front of the town square (a reference to The Telltale Head, when Bart cut it off) . 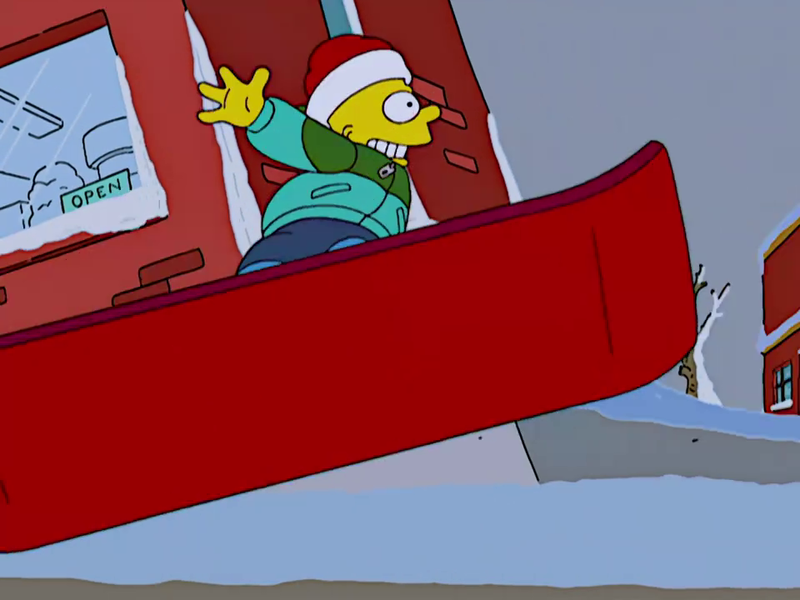 The head then falls off on Ralph Wiggum, about to eat an ice cream. 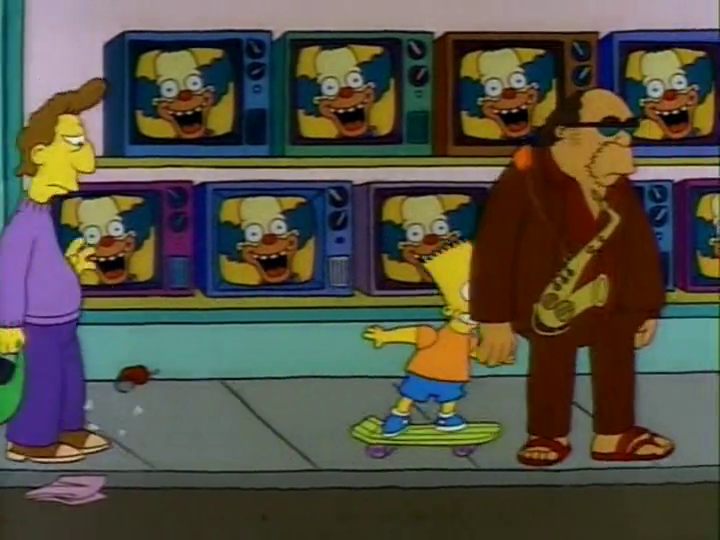 Panning behind Ralph, the camera passes by Android's Dungeon and a Lard Lad Donut Statue (where the crow lands) on the left and a new Billboard gag, that changes every episode, on the right. 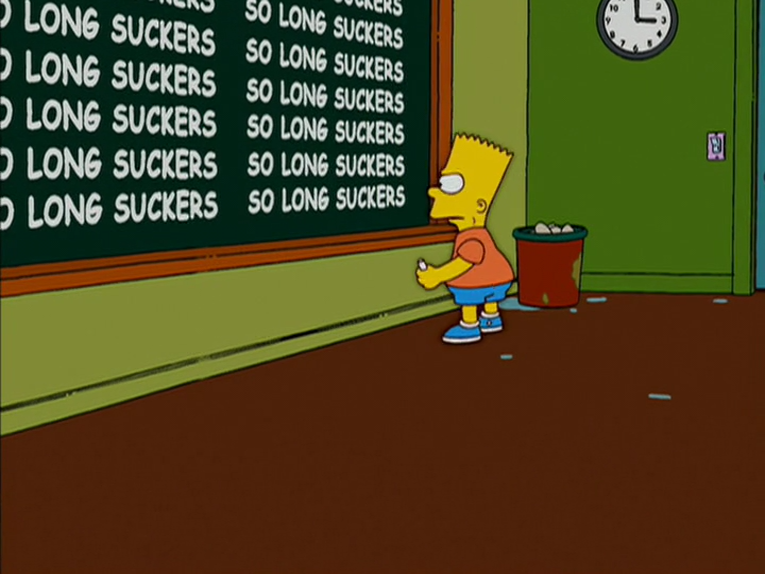 The scene continues to zoom in through a window of Springfield Elementary, where Bart is writing the Chalkboard gag. 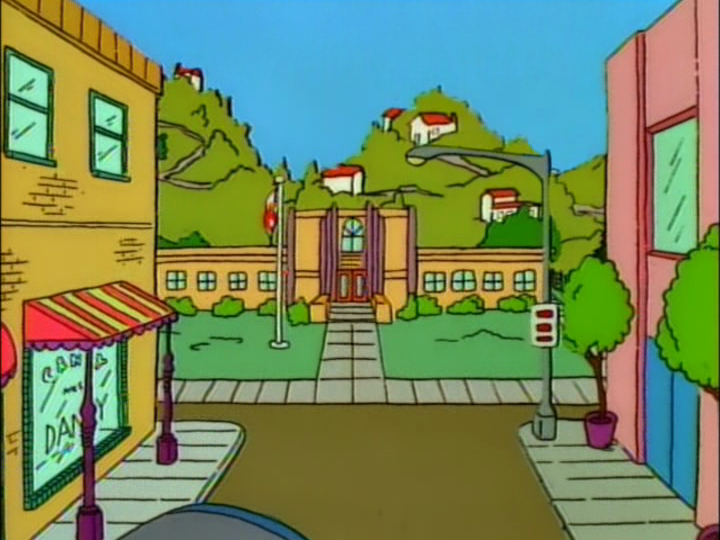 (NOTE: The newest opening spends a lot more time on the previous gags, so the pan to the Springfield Elementary School to Bart's classroom is quicker, with slightly less time to read the gag before it's all in view.) 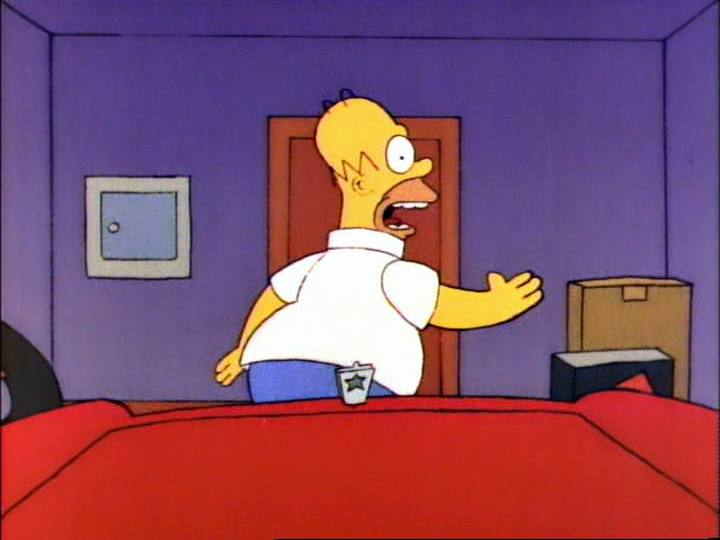 In the classroom, the portrait on the wall is of Homer as an astronaut. 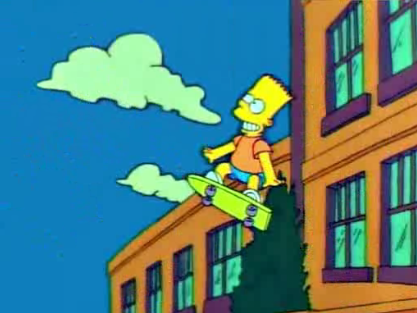 The bell rings and Bart zooms out of the school, onto his skateboard, and lands into a pile of leaves Groundskeeper Willie just finished raked up. 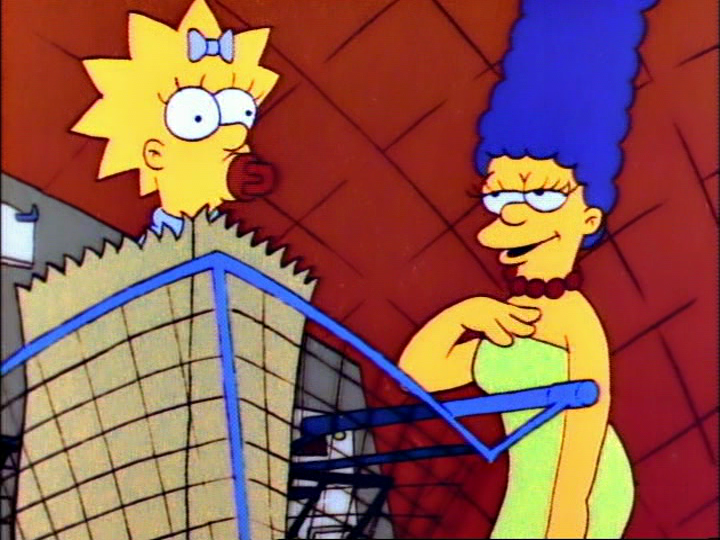 As Bart jumps off the pile, Barney Gumble is revealed under the pile and belches. 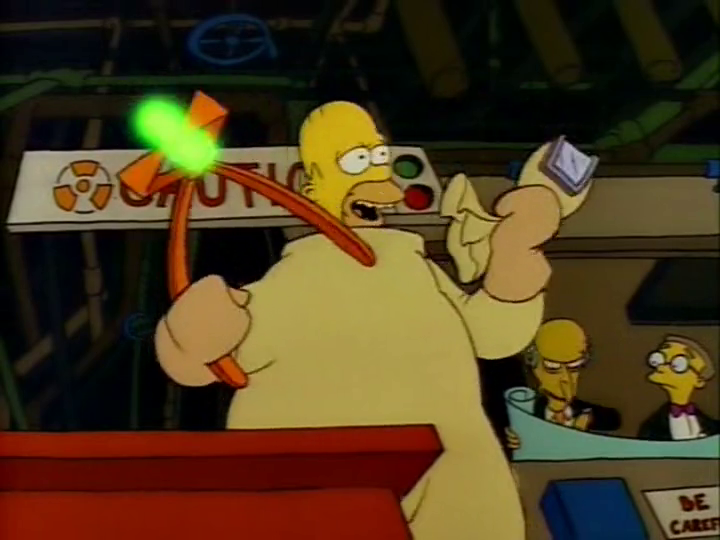 The next scene shows Homer getting ready to head back home with a uranium bar stuck on his back. 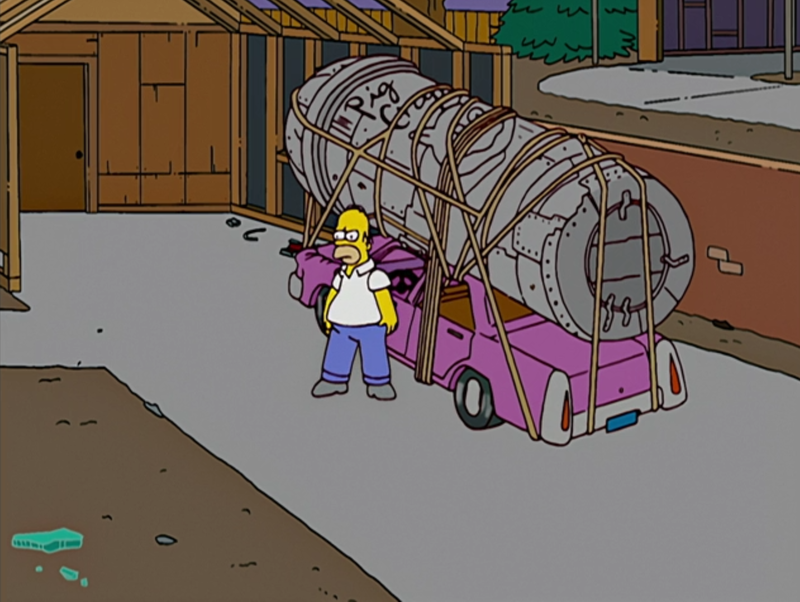 In the background, Lenny Leonard and Carl Carlson were putting up the number 3 over the number 2 on a sign that says 'Days Without An Accident.' However, they fall off the ladder as they hear the whistle for the end of the shift. 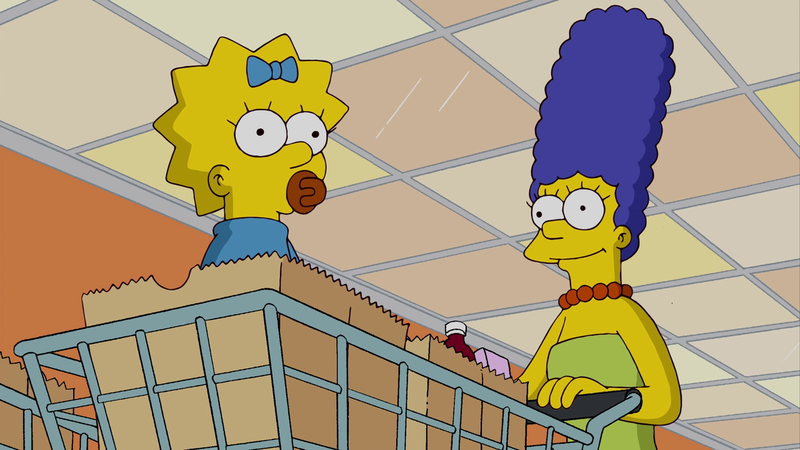 The next shot shows Marge and Maggie, with Selma Bouvier and Patty Bouvier, checking out with the groceries. 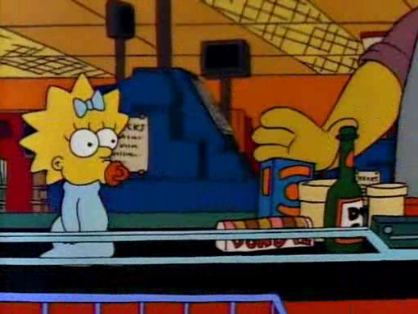 The items on the conveyor belt include Tomacco juice and Mr. Sparkle power clean detergent (labeled in katakana). 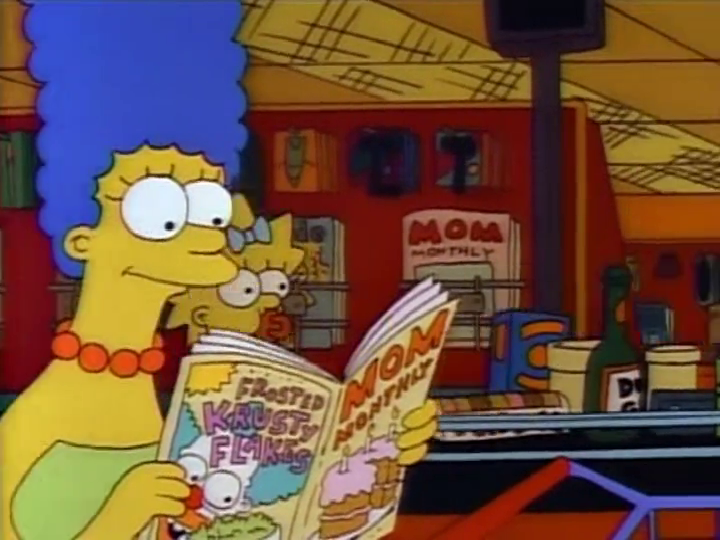 When a box of Krusty-O's is scanned, the total amount on the register changes from $236.60 to $243.26, which means the price of the cereal is $6.66. 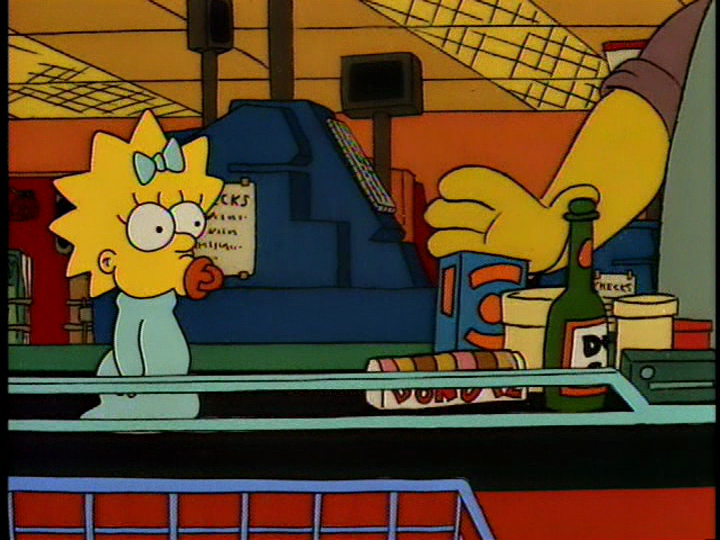 Maggie is inadvertently scanned too, which doubles the register total to $486.52, and she is mistakenly packaged with the groceries. 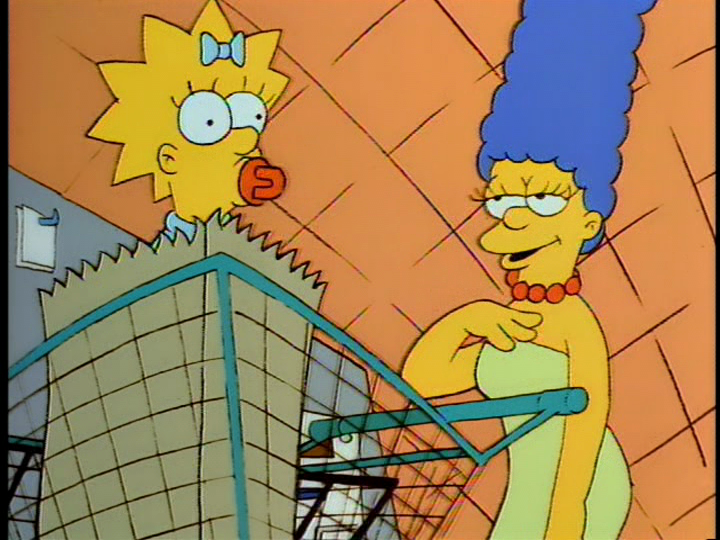 Marge looks mildly concerned but smiles well as Maggie pops out of the bag. 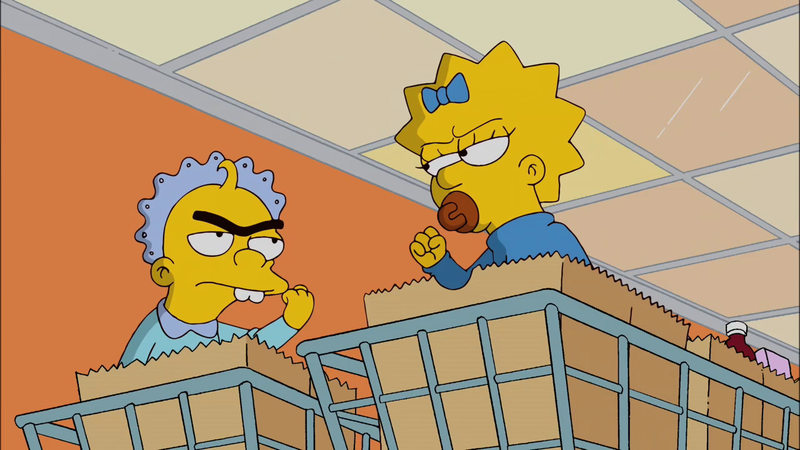 Maggie then sees Baby Gerald and angrily shakes her fist at him as Gerald does the same. 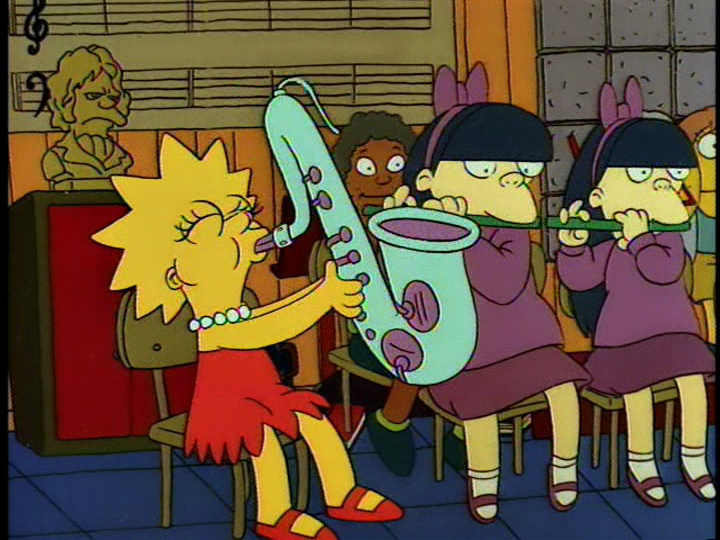 During Lisa's sax solo, more "common" characters are shown in the orchestra. 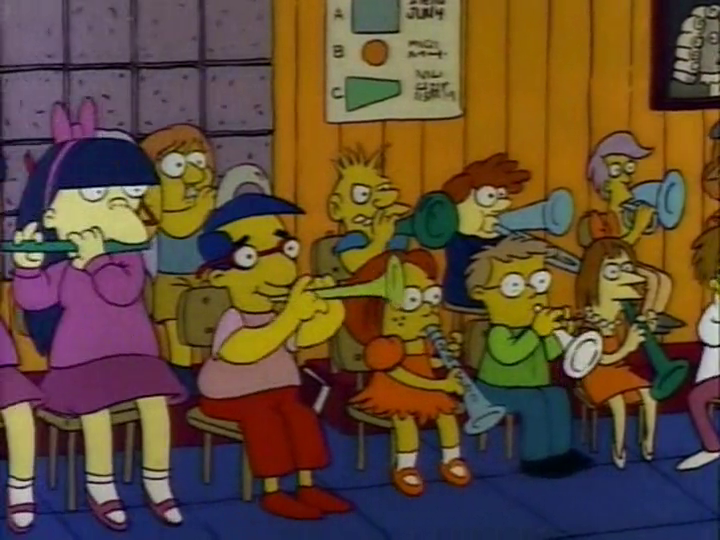 Recognizable characters include (back row, right to left) Wendell, Database, Martin Prince, Jr., Richard, Lewis, Cosine, Ham, Report Card, and Jessica Lovejoy, and (front row, right to left) Janey, Milhouse, Sherri and Terri (playing video games), and Lisa. 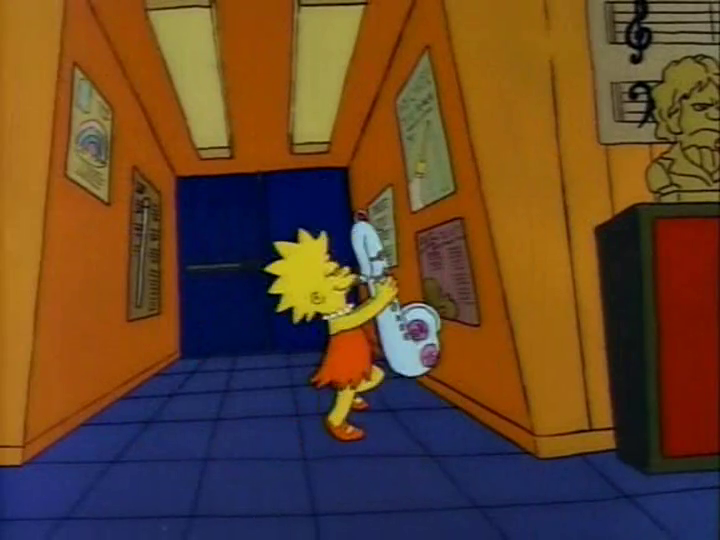 Also, Largo dismisses Lisa earlier, showing her longer. 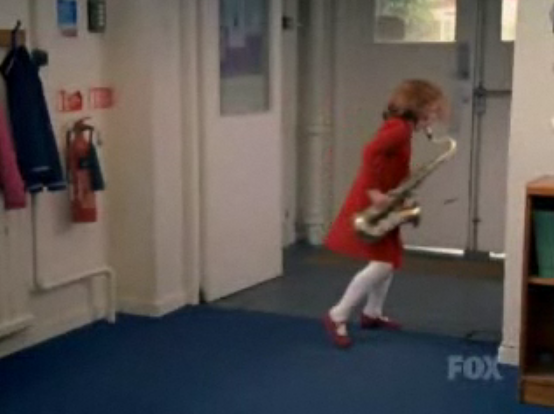 At the end of her solo, she ducks inside briefly for a flourish and smiles. This part may be of variable length, and a split second longer than the previous opening. 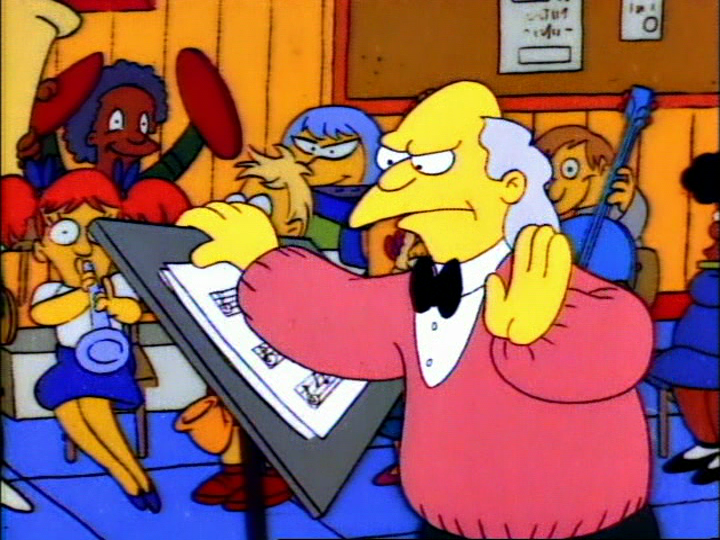 Also, there is an additional picture of Bleeding Gums Murphy on the wall. 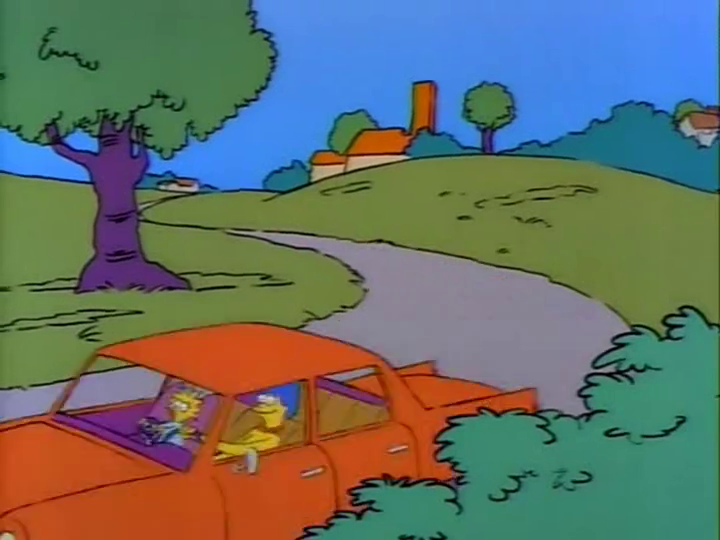 Agnes, Skinner, Chalmers, Milhouse playing ball with Richard and Lewis, Willie on his tractor, Ralph playing on Frank Grimes' grave, Martin about to be beaten by the three bullies, Squeaky-Voiced Teen, Quimby and Miss Springfield wearing each others' sashes, Chazz Busby, the sea captain holding a 3-eyed fish, Patty and Selma still sunbathing in those suits, Cletus and Brandine with Plopper, Kang and Kodos in a UFO, Burns and Smithers, Kent and Doug, Sherri and Terri still playing video games, Krusty smoking on a wall with "El Barto" graffiti, Bumblebee Man and Luigi watching the UFO, Eddie and Lou at the bus roadblock, Snake stealing Lou's gun, Fat Tony with Legs and Louie burying someone, Miss Hoover changing the flat tire on the broken-down bus, Wendell still leaning out of the bus (sick), kids in front including Janey, Dr. Hibbert with a clipboard (but no Monroe), Duffman, Jessica Lovejoy, Mr. Teeny and Sideshow Mel, God (whose head is off-screen) fighting the devil (who's standing on a tower), and finally Rod and Todd playing in their yard. 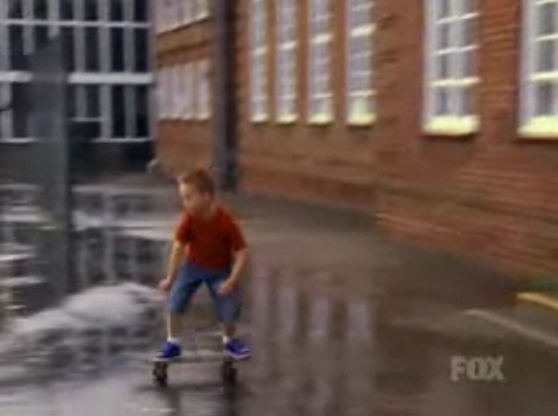 During the driveway scene, there is oil stain on the pavement. 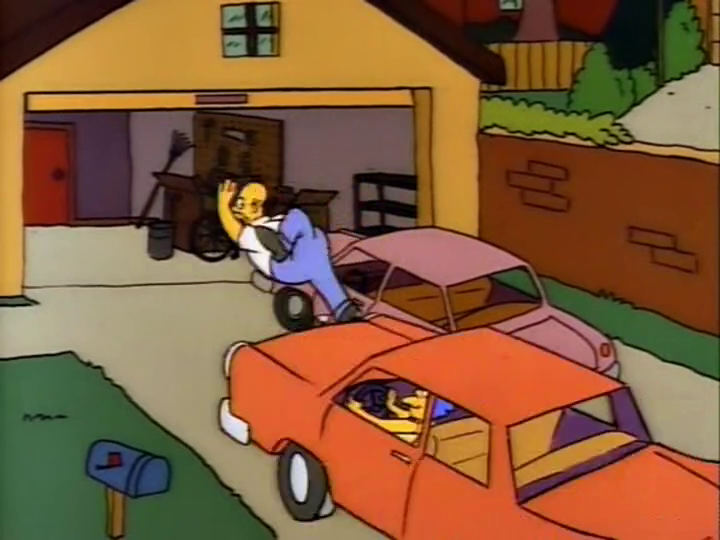 Also, the main change is that instead of running away from Marge's car and screaming, Homer is hit with the car and flattened on the hood; instead of running through the door, he is hurled grunting through it by inertia, leaving a Homer-shaped hole. 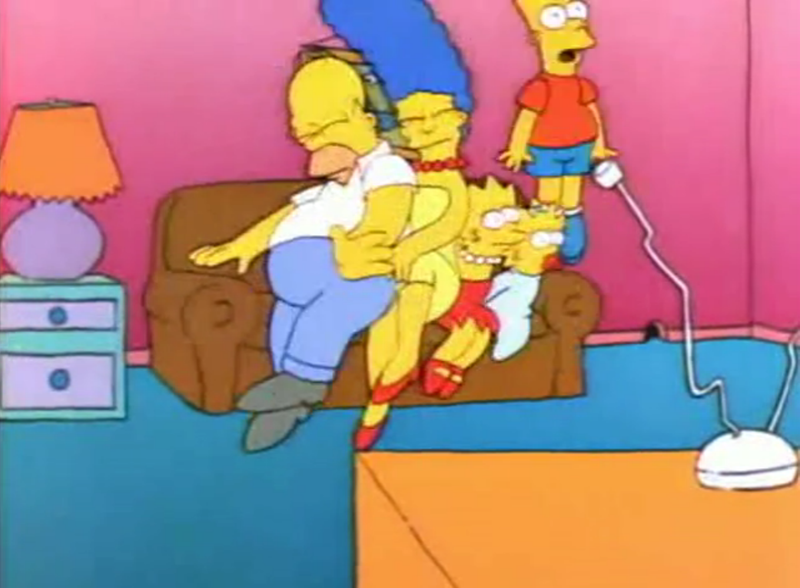 Upon entering their house, the couch gag follows. 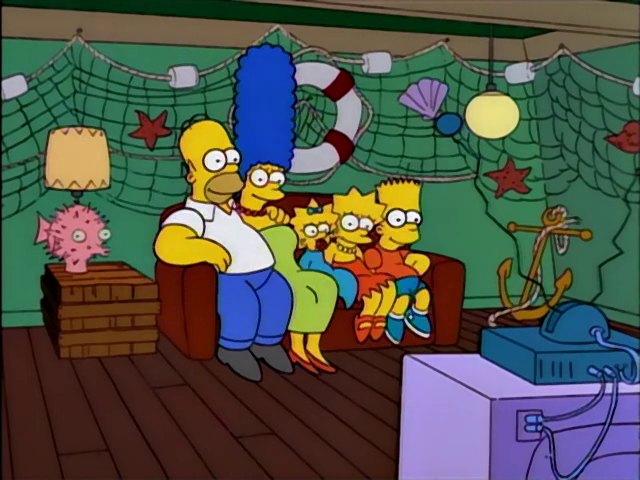 The living room is mostly the same, but the TV is now a widescreen HD model, with the bent rabbit-ears still on top. Again, a widescreen set, with four unmarked buttons on the right, speakers below. A VCR or some unit is on top still. 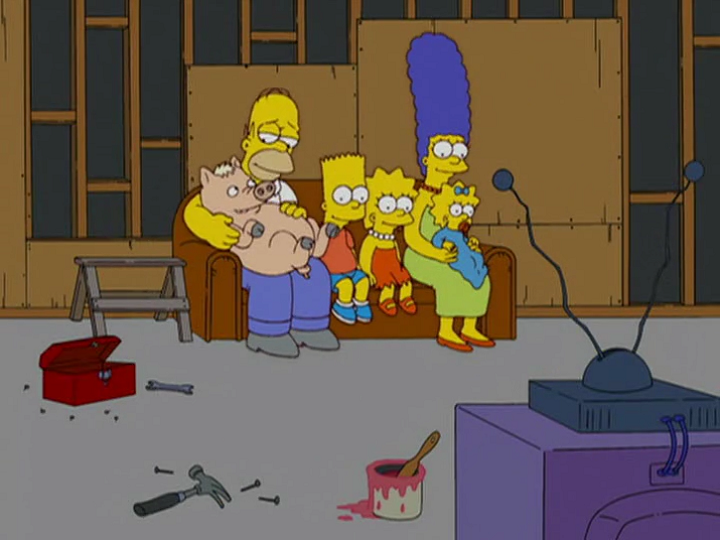 As the theme song ends, the television showing the opening credits falls off as if it was hung on the wall. Also, unlike the previous opening sequences, there is no cut to black; the episode begins immediately. 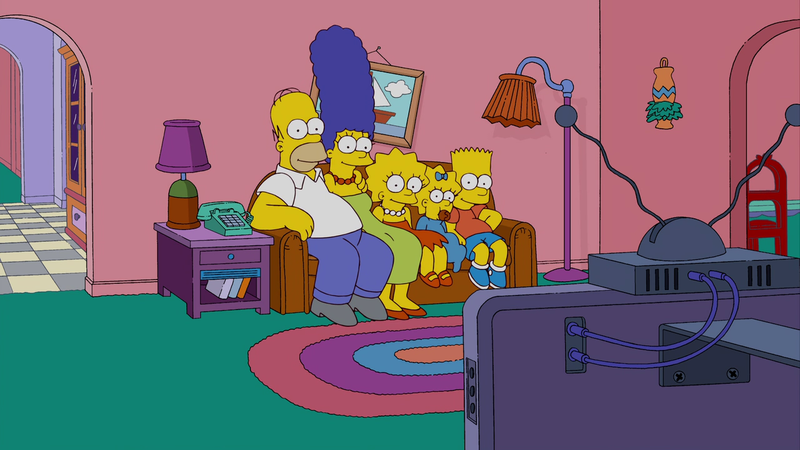 In 2006, Sky1 in the United Kingdom began advertising The Simpsons using a live-action recreation of the series' opening sequence directed by Chris Palmer. It was the second time they had done so, the first being in September 2000 as part of a weekend celebrating the 10th anniversary of the show premiering in the UK. 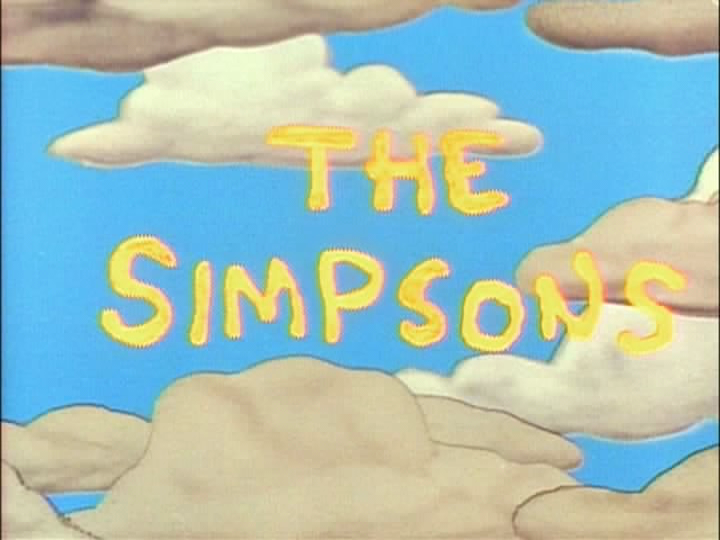 Except for the very first shot in which the logo appears out of the clouds, every piece of the opening is present in this version, with even multiple chalkboard and couch gags filmed. 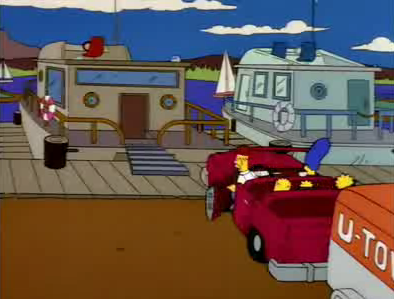 Attached to the end of this sequence is the message "Come home to The Simpsons on Sky One." A version was also made for cinema distribution. 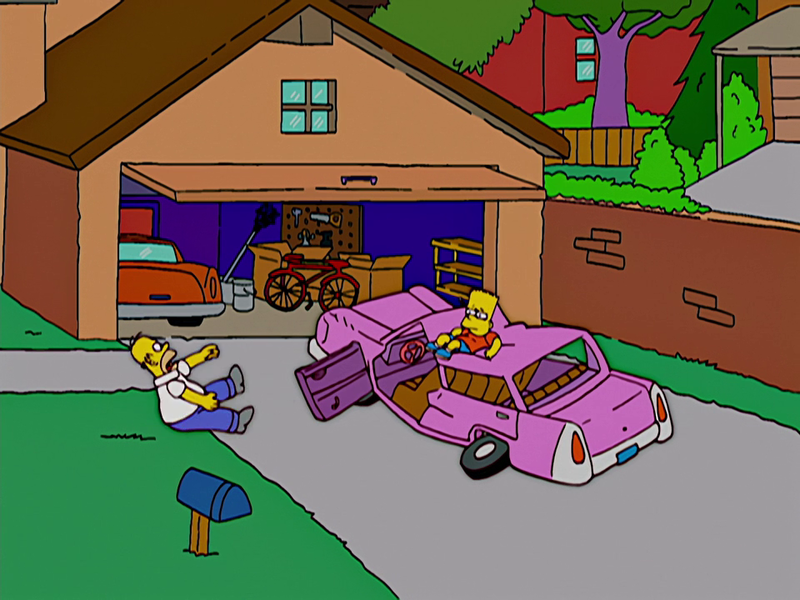 Because the live action sequence was made in the UK, there are some slight cultural differences, such as Homer and Marge driving on the left in a right hand drive car, and the actor playing Chief Wiggum wearing a British police uniform. 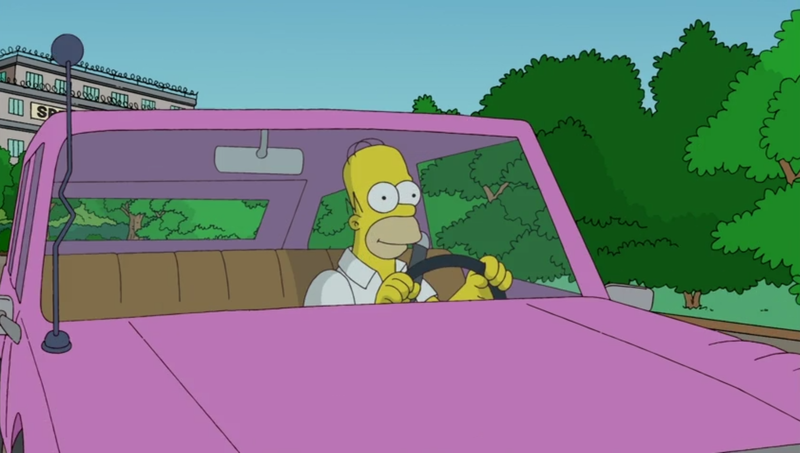 The sequence was used instead of the regular opening titles on the episode "Homer Simpson, This Is Your Wife", first broadcast on FOX on March 26, 2006 with the images during the driving scenes mirrored so that the cars appeared to be driving on the right side of the road with the steering wheel on the left side of the car. 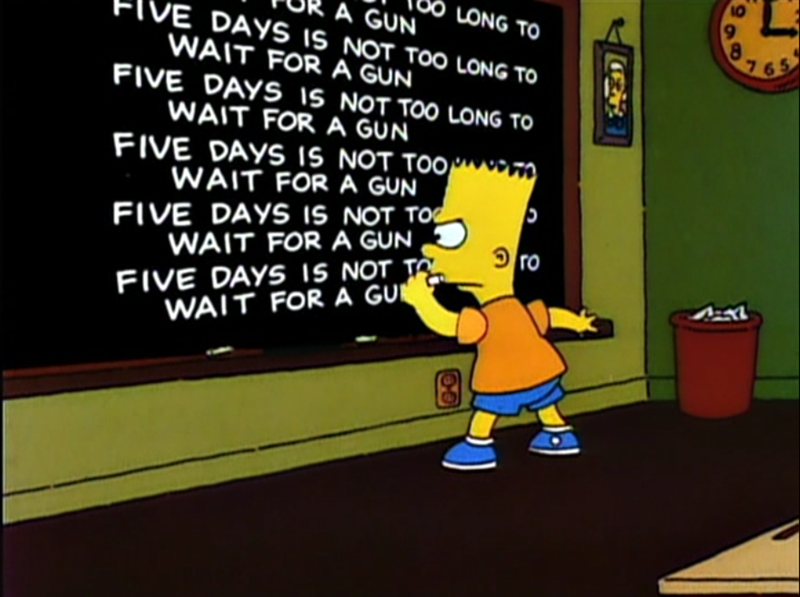 Another fall afternoon at Springfield Elementary finds Bart Simpson engaged in his after-school punishment. 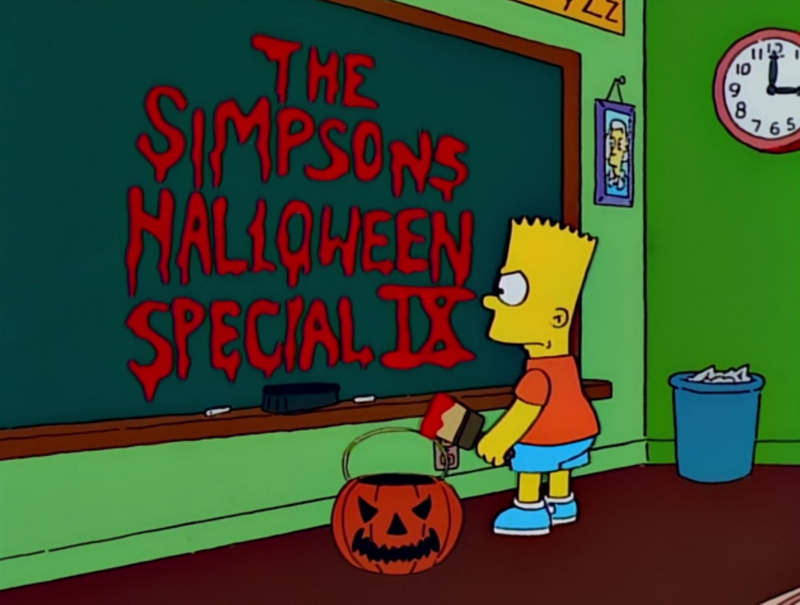 This time, he has to write "The Simpsons Halloween Special IX." 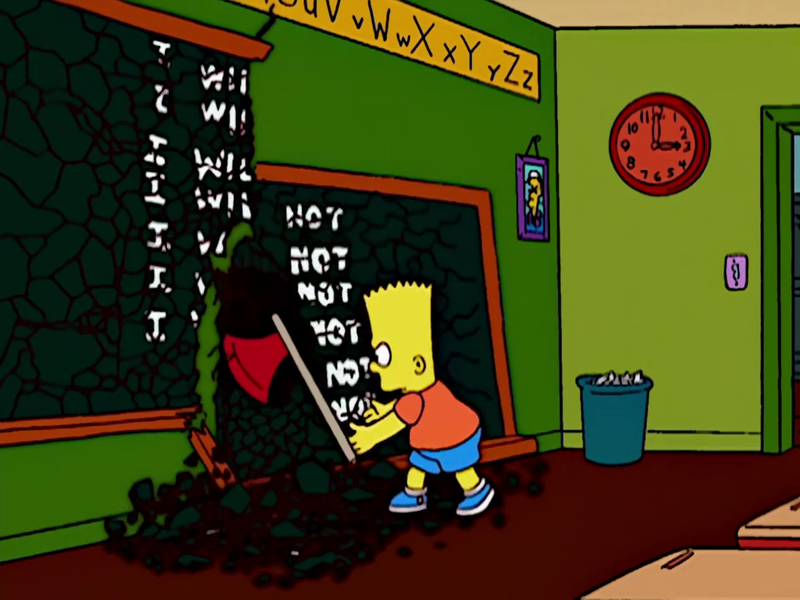 Instead of the usual chalk, Bart chooses to write the message in blood (dipping the brush into a jack-o-lantern bucket when it's time for a refill). 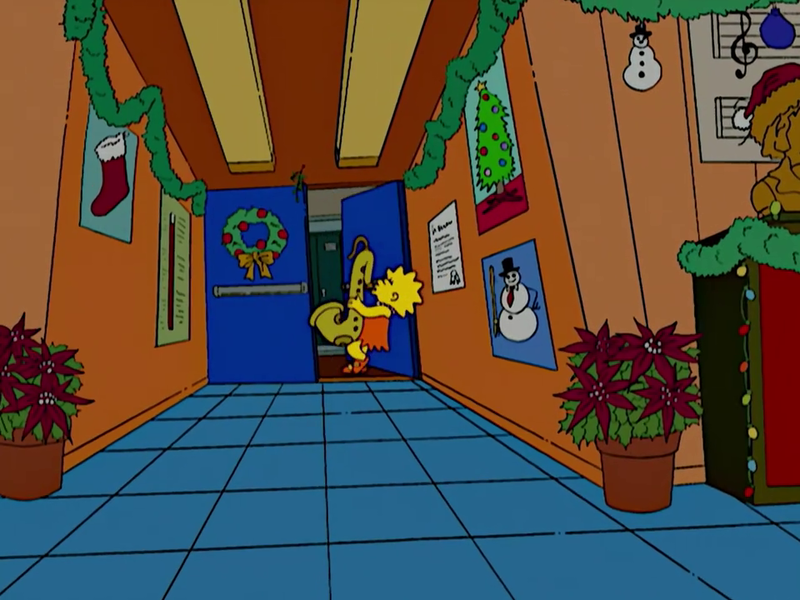 When the bell rings, he tosses the brush down and gleefully runs out of the building. 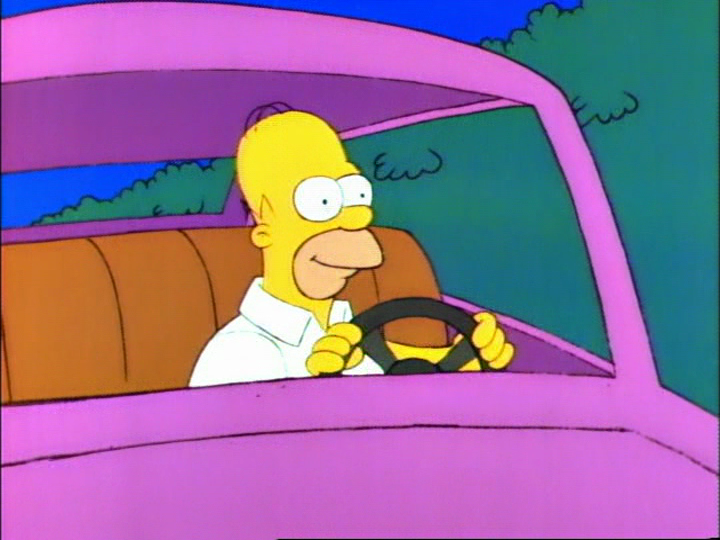 At home, Homer pulls into the driveway. 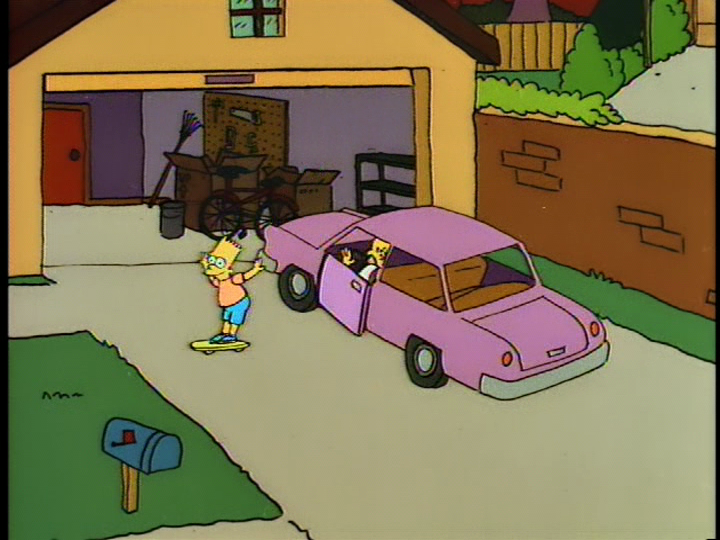 Bart skateboards in from the right, jumps the retaining wall, and bounces off the roof of Homer's car only to land with a thud in the driveway. 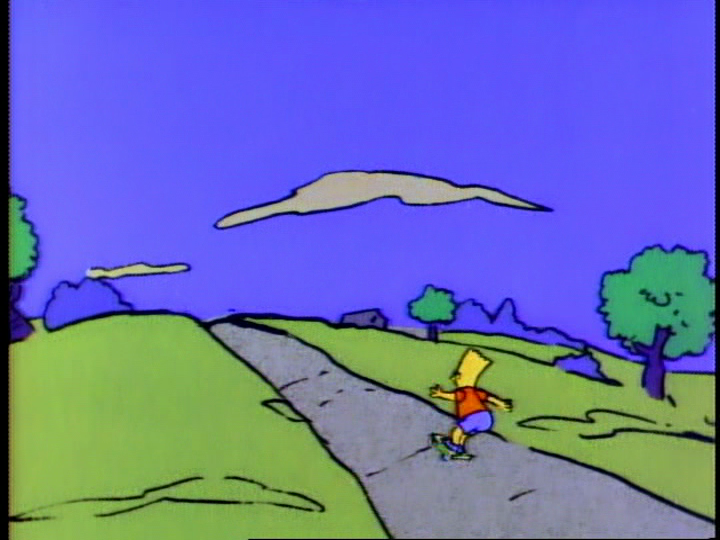 Lisa races in on her bike and slams into Bart's broken body. 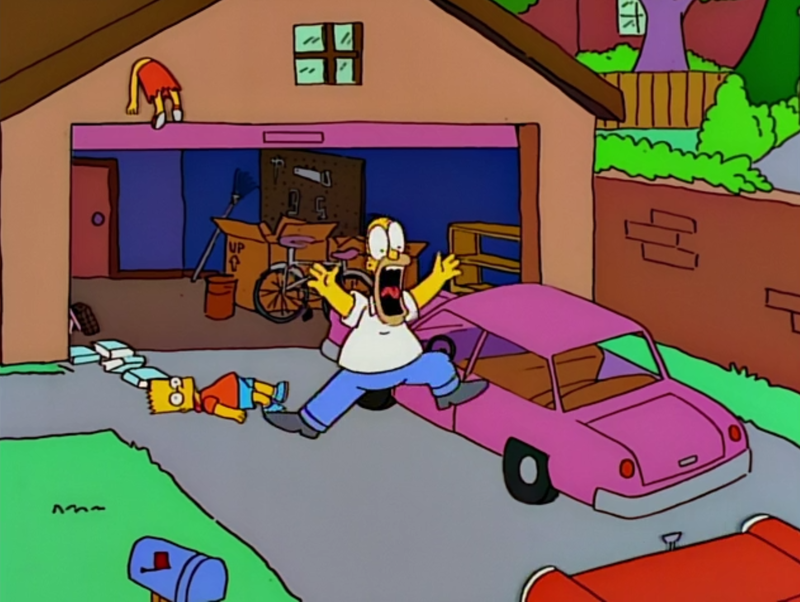 The impact launches her from her bike, and Lisa is firmly lodged into the wall of the garage, just above the door. 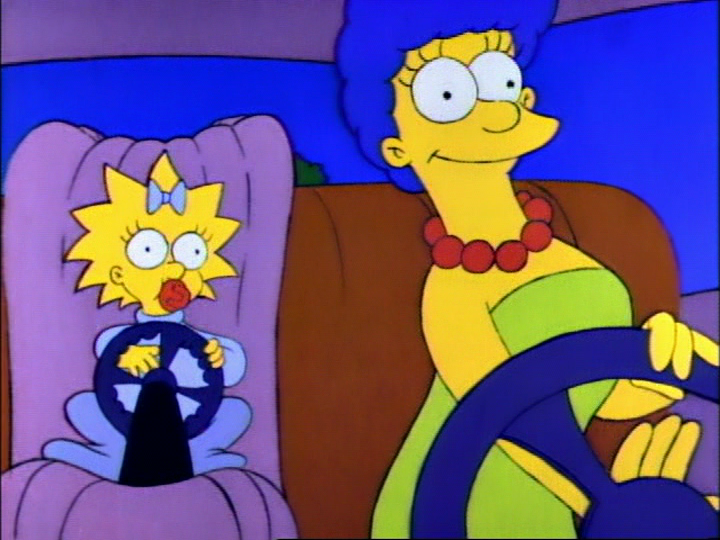 Marge and Maggie cheerily drive in, beeping their horn, but Homer is too slow in getting out of the way. 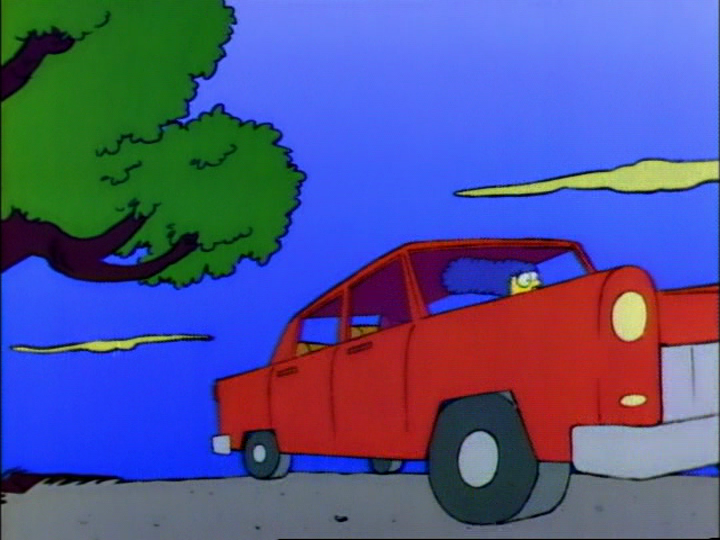 He becomes a permanent hood ornament for Marge's car. 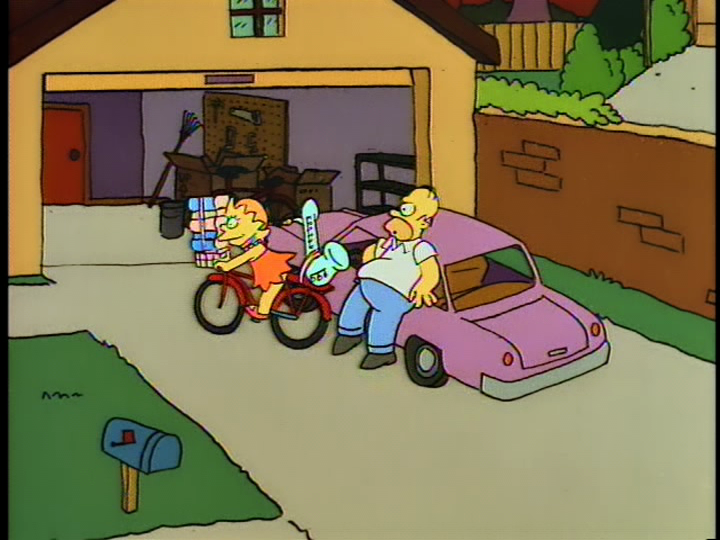 Meanwhile, in the Simpson living room Freddie Krueger and Jason Voorhees wait vainly for the family to arrive. Freddie glances at his watch, and says they should have arrived by now. Jason just shrugs and takes things in stride. 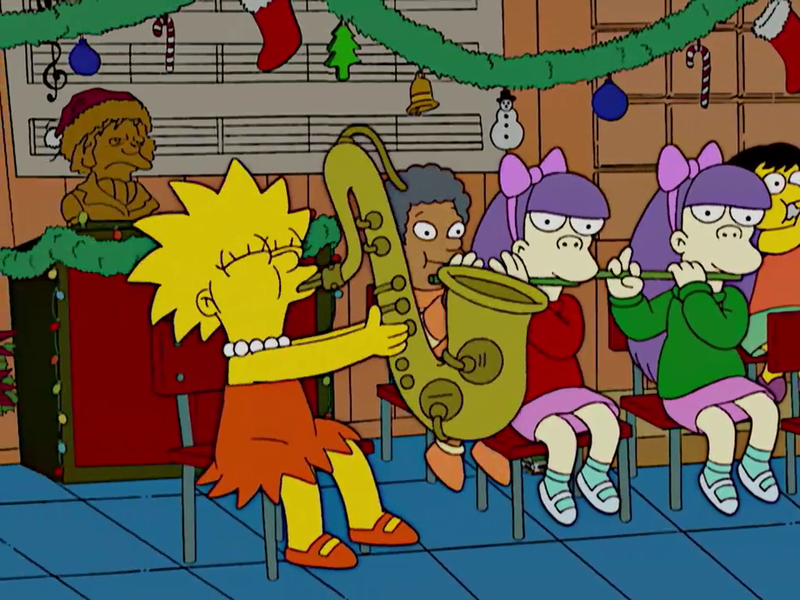 Lisa's saxophone solo is a jazzy version "Deck the Halls"
Bleeding Gums Murphy, who is now deceased, has been replaced with Jasper in a Santa costume. 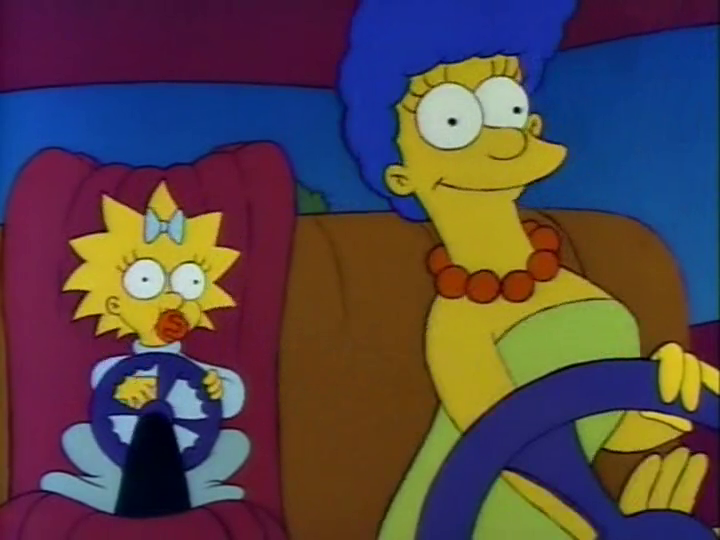 Maude Flanders however, remains in the pan across Springfield, despite having also died. 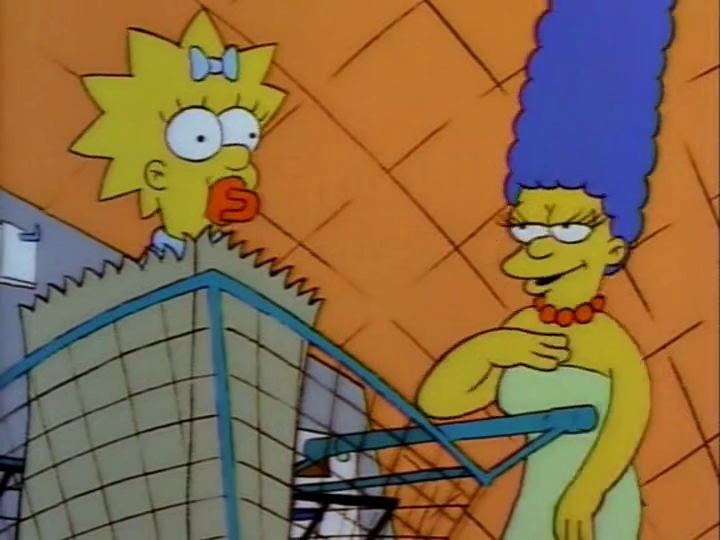 Marge and Maggie's supermarket and car sequence have unfortunately been cut. In the pan characters from the street as well as Jaffee and Bernice Hibbert have been added. 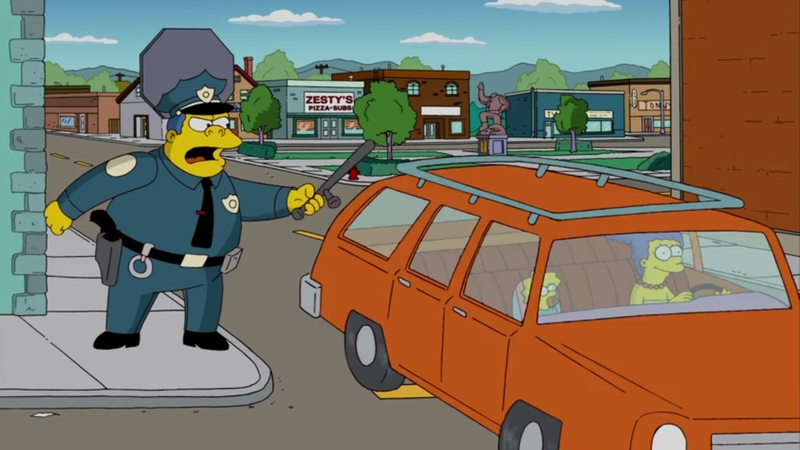 Chief Wiggum stands in place of Dr. Hibbert in the pan. Hibbert is with his wife. 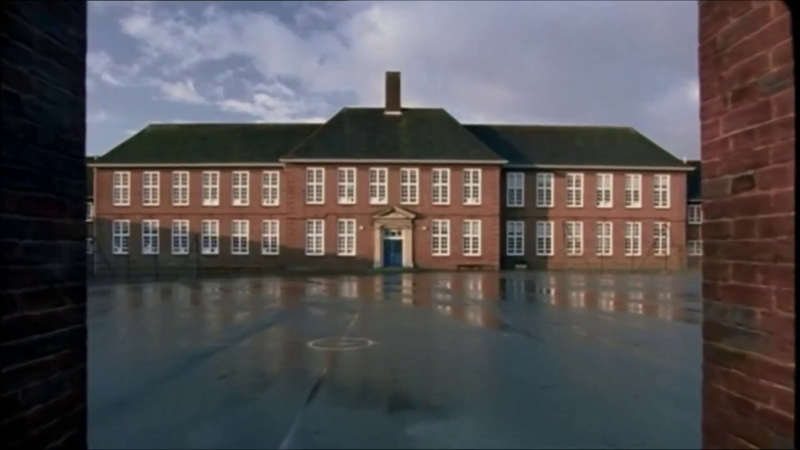 The Winfields are absent from the pan. Wendell is no longer leaning out the bus window. Patty and Selma are making snow angels rather than sunbathing. 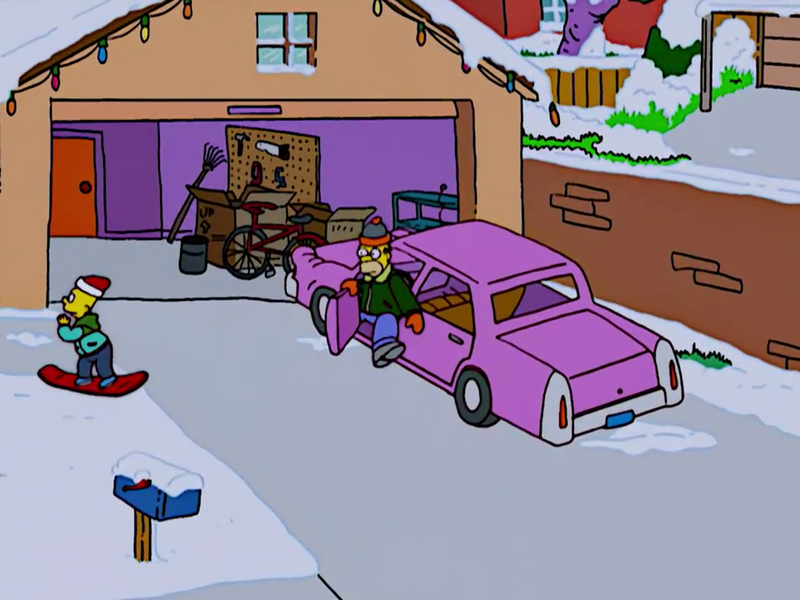 Richard isn't with Milhouse and Lewis, but with Jaffee and Sophie Jensen. 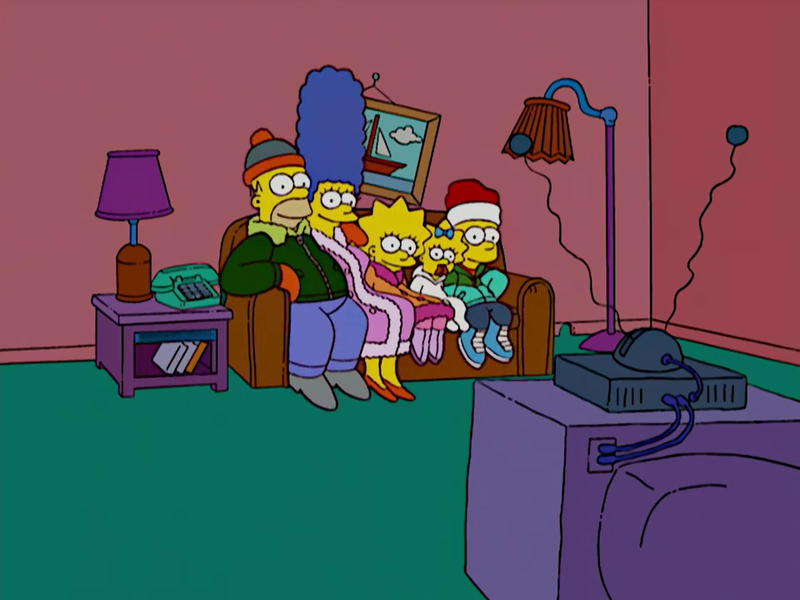 In the end, the family sits on the couch and the camera then pulls out to reveal that the family was reflected in a Christmas ornament, which rests on a Christmas tree. 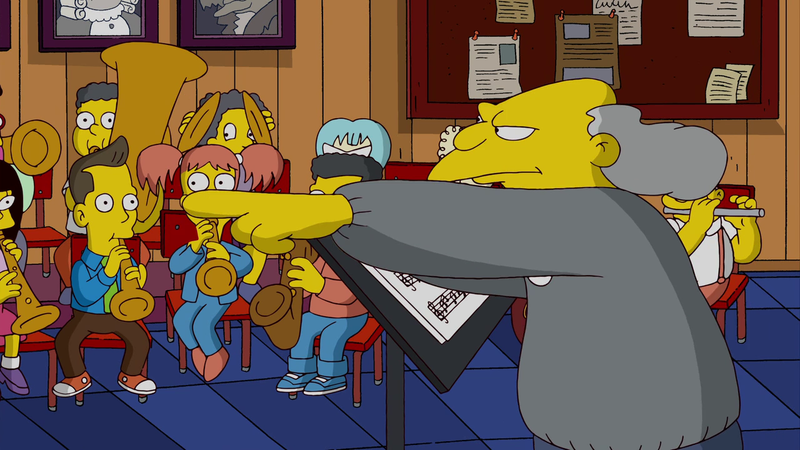 The sequence was completely remade for The Simpsons Movie and features the orchestrated version of "The Simpsons Theme" as adapted by Hans Zimmer, which is slightly different from the first track of The Simpsons Movie: The Music CD. 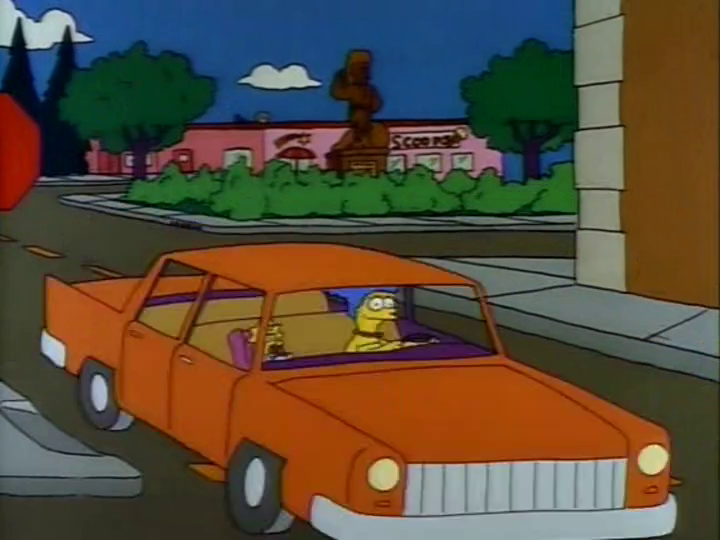 The pre-sequence scene is displayed in a 16:9 television aspect ratio, with black matte bars at either end of the screen. 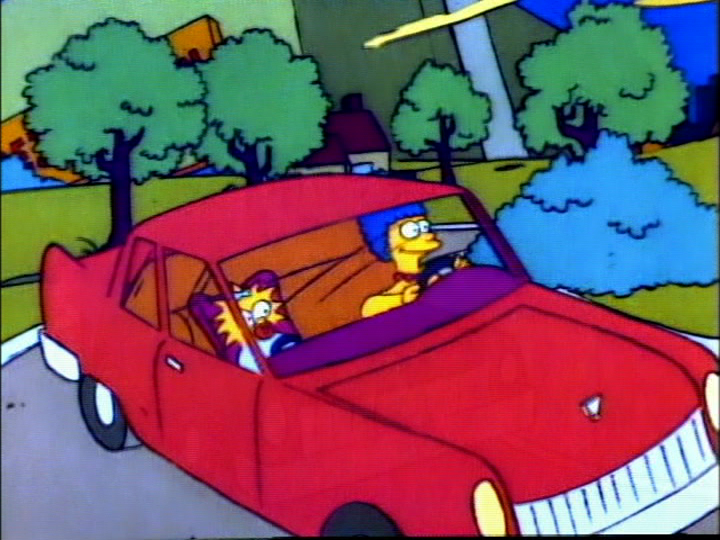 As the sequence begins with the "The Simpsons" logo appearing out of the clouds, Professor Frink flies past in one of his inventions carrying a banner marked "MOVIE" and saying "Moo-vie! On the big screen!!" 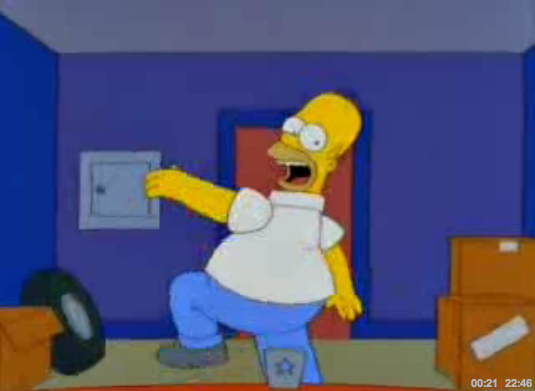 (at the very beginning of the DVD menu, he says "Moo-vie! On the small screen!!" in a similar vein to how he does it in the film) When he hits the bar on the left side, both it and the one on the right nudge out of view so that the image fills the entire screen. 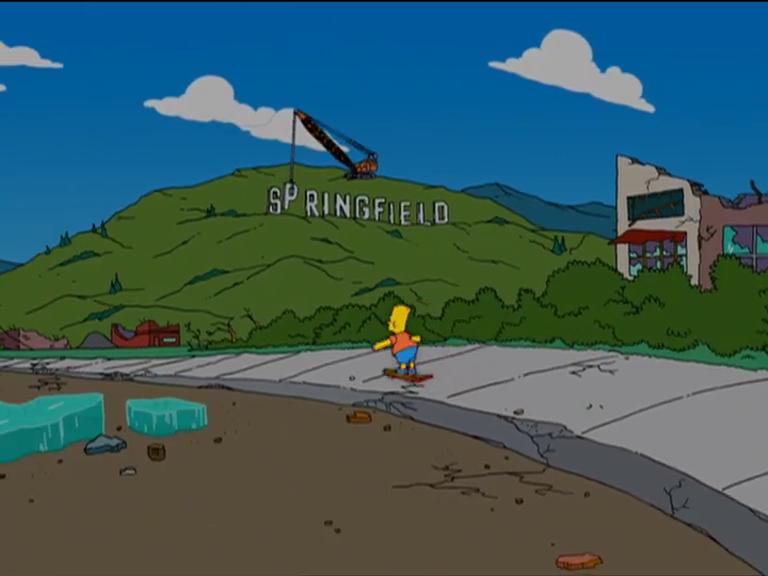 Instead of going through the P of "SIMPSONS," the camera goes through the O of "MOVIE" as the banner falls loose. 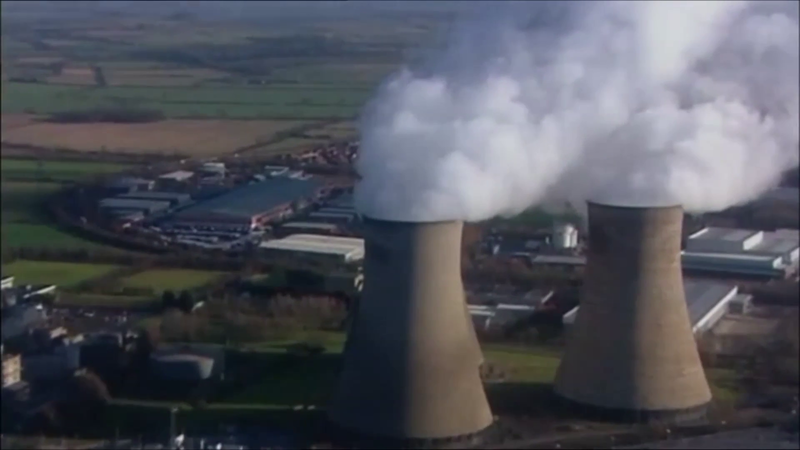 The camera zooms in on the town, with several major landmarks popping-up. 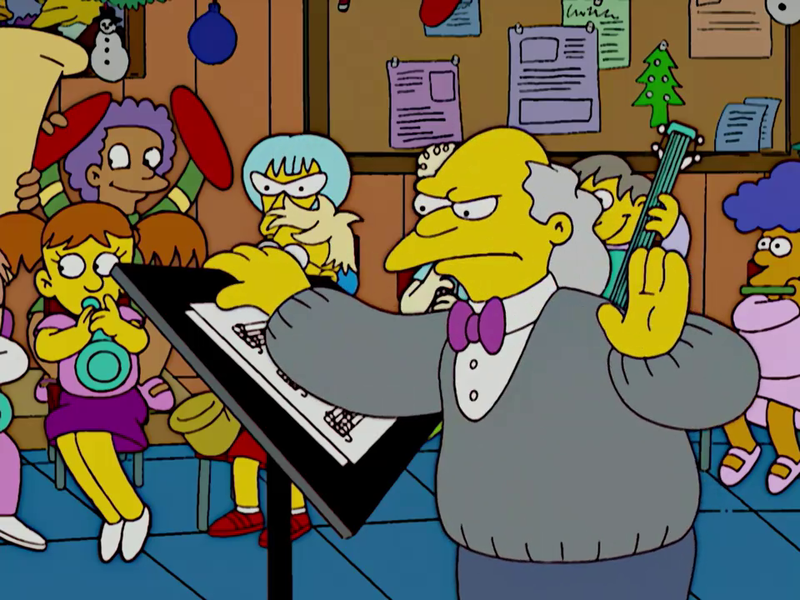 The camera then zooms in to Mr. Burns, who is holding a toothbrush in his bathroom with Smithers who gives him toothpaste, the extra weight of the toothpaste causes frail Mr. Burns to collapse. 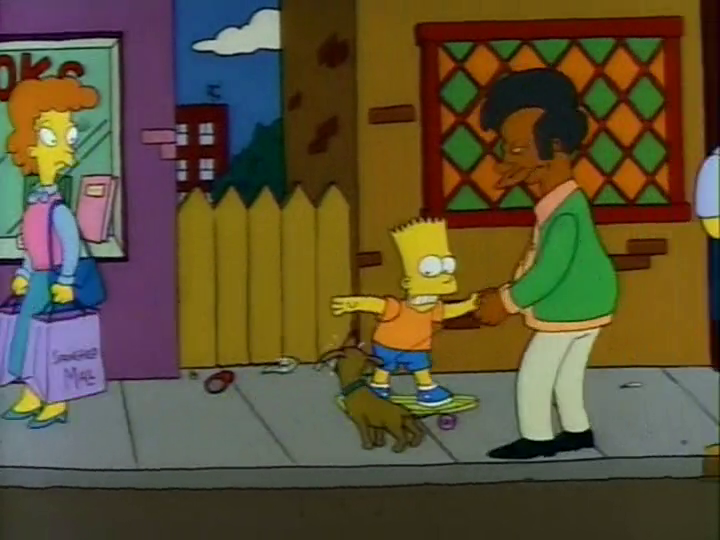 The camera then zooms past Moe's Tavern into the Kwik-E-Mart where Apu is secretly changing the expiration date on one of his products from 2006 to 2008. 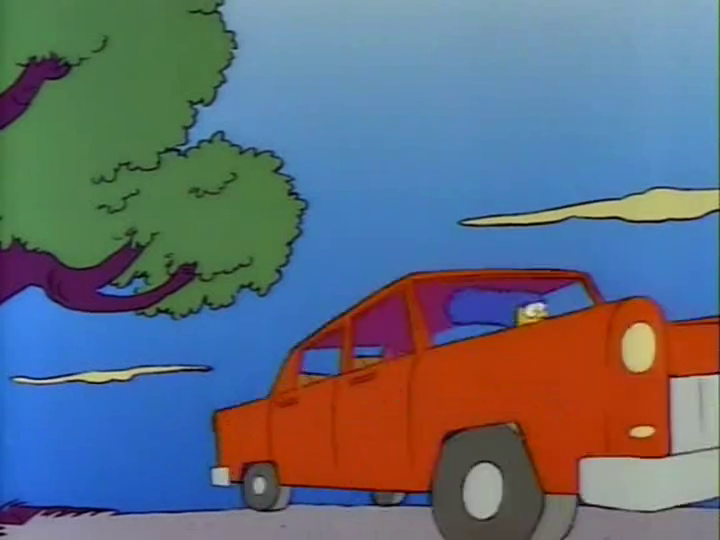 Next the camera cuts to Springfield Elementary where Jimbo, Dolph and Kearney are hoisting Martin Prince, Jr. up a flagpole by his underwear and saluting it as if it were a flag. 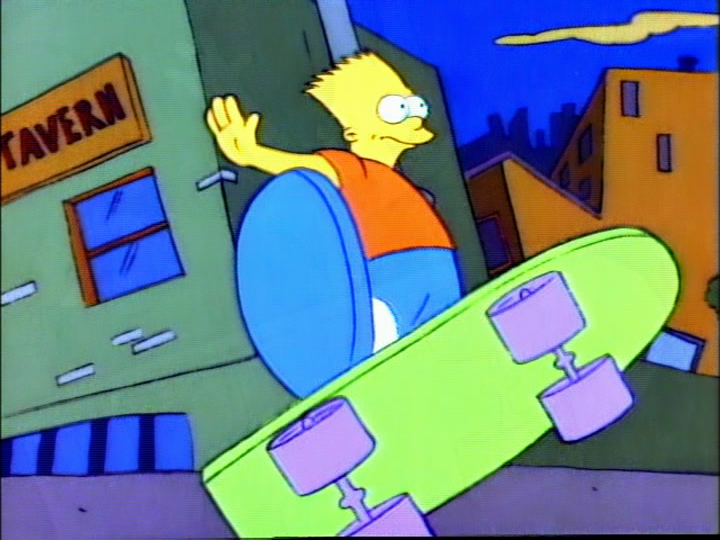 The camera then zooms through the window where Bart is writing lines for detention ("I will not illegally download this movie") before finishing with Green Day who are hosting a concert at Lake Springfield, playing their version of the theme song and using a teleprompter to get its "lyrics" right. 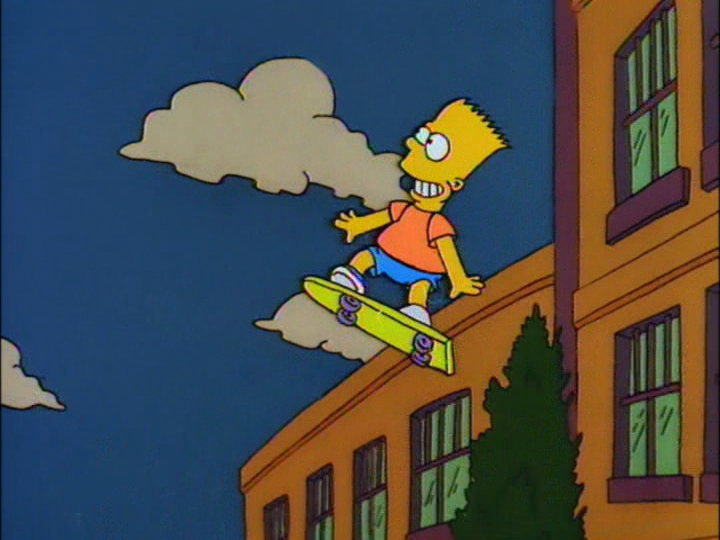 For "He Loves to Fly and He D'ohs," the first new Simpsons episode to air after the release of The Simpsons Movie, a callback sequence was animated. 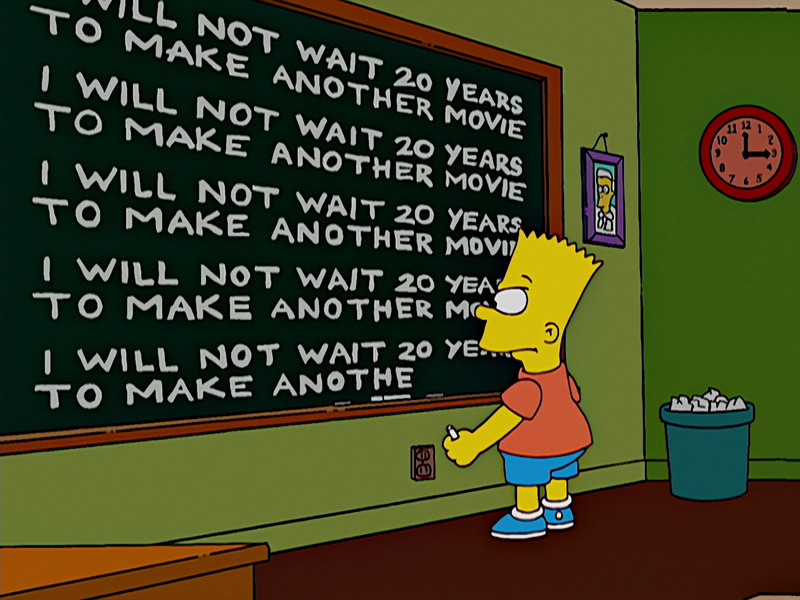 The sequence begins with Bart writing lines on the chalkboard, writing "I will not wait 20 years to make another movie". 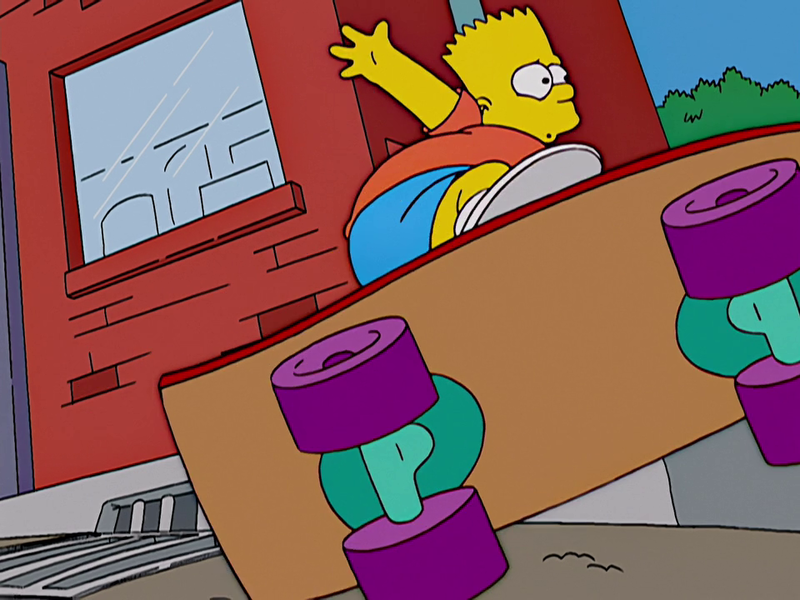 The school bell rings and he skates outside the door, showing the residents of Springfield restoring the town after the events of the movie. 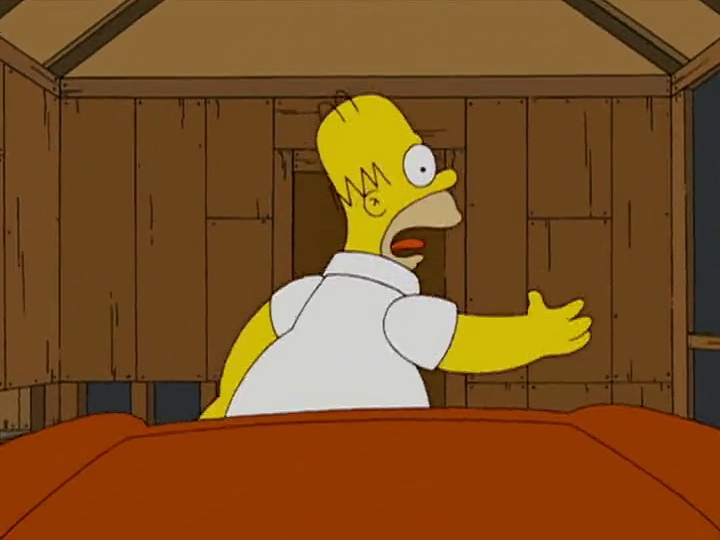 The multi-eyed creature from the movie is seen jumping onto Bart's shoulders, but is hit by a wrecking ball into a billboard of "Burns' Constructions", suggesting that Mr. Burns is attempting to regain his lost wealth by making money from the incident. The camera then pans on a large shard of glass, a piece from the destroyed dome. 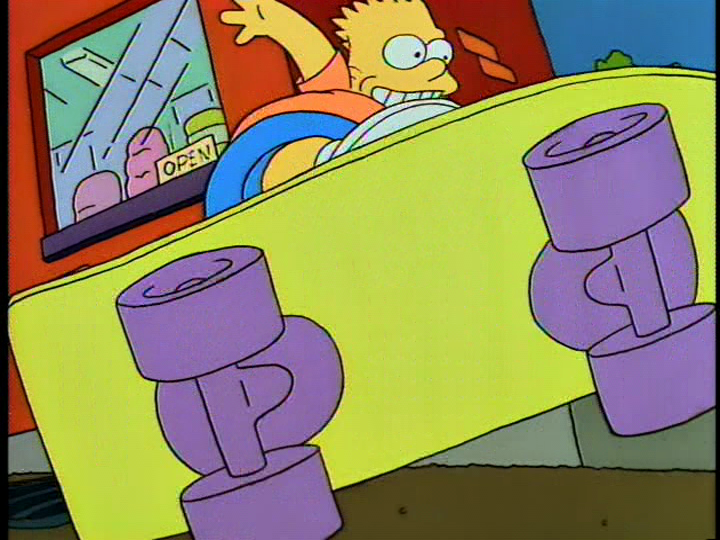 Bart rides on the piece, and weaves in between characters from the movie; President Schwarzenegger, Colin, Moe Szyslak (in his "Emperor" attire and shouting "Hey! 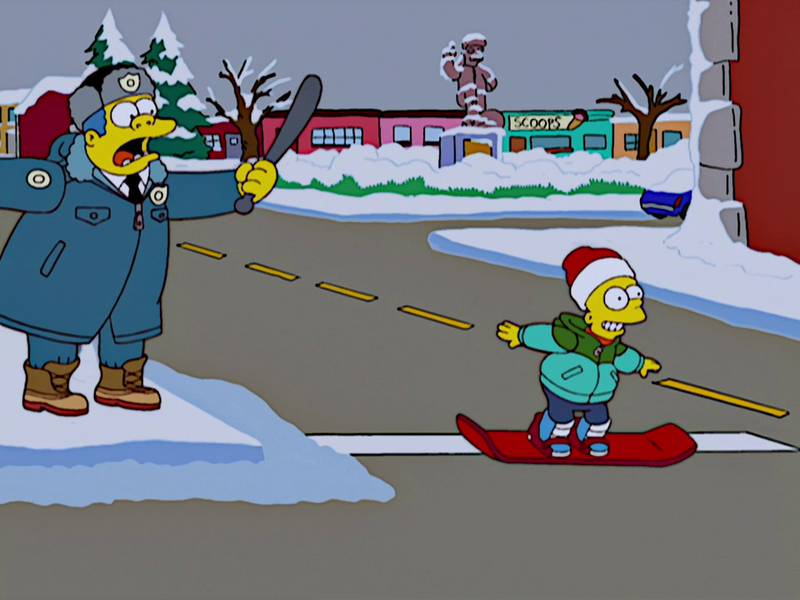 "), Russ Cargill, and the Medicine Woman, who waves her hand in a similar manner to Chief Wiggum and shouts "Why you...". 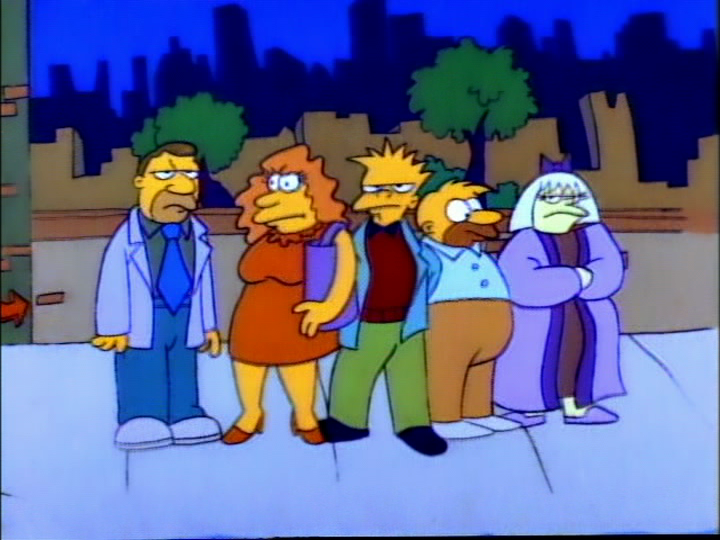 In the Opening of "To Surveil with Love" the Simpsons characters Lip synced to Ke$ha's "Tik Tok" as part of the "Fox Rocks" event on the FOX channel. 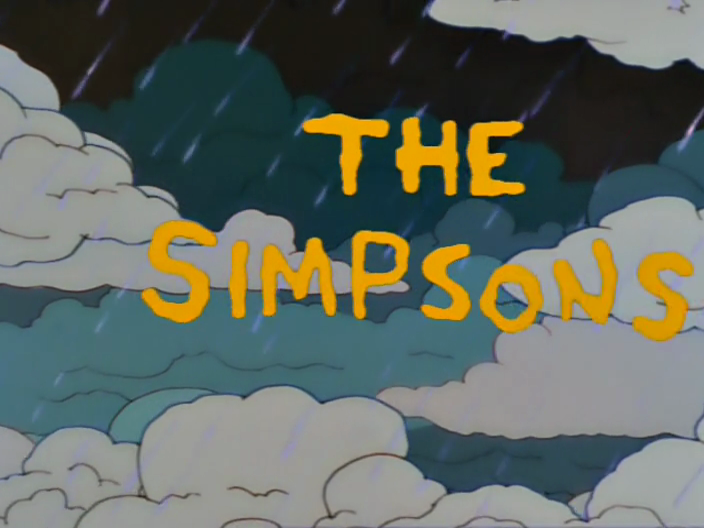 This is the first canonical episode that does not feature the original theme song in the opening sequence in any capacity, in the show's history. 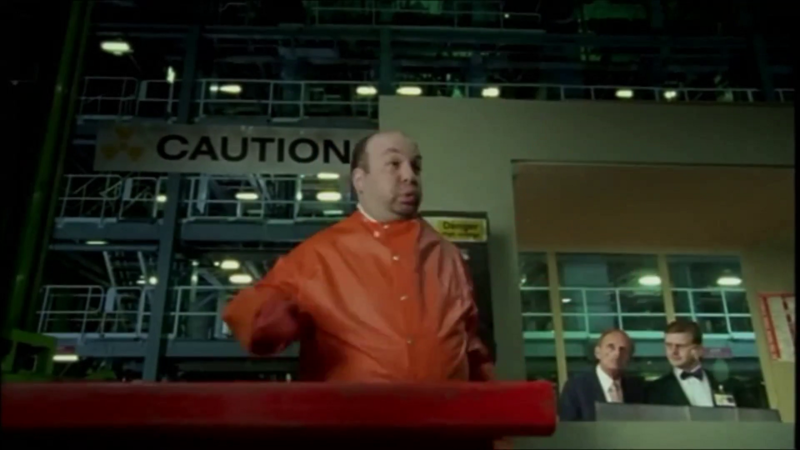 The sequence features the characters performing actions that relate to the lyrics of the song. 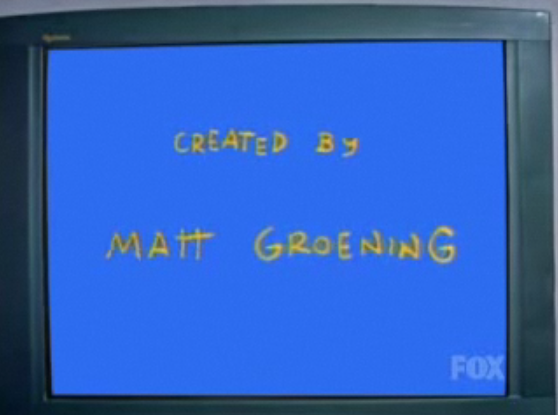 The screen showing "The Simpsons", also read "500th episode", and below that "The most meaningless milestone of all!". 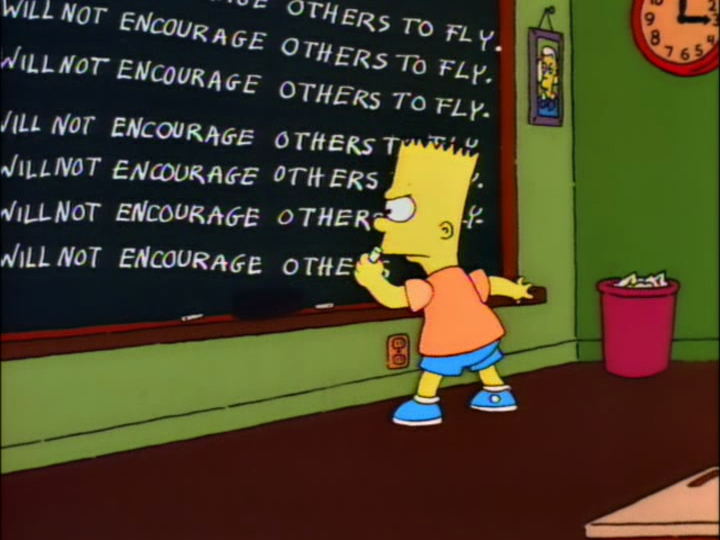 During Bart's chalkboard gag, Bart is replaced with Milhouse, while Bart is watching. 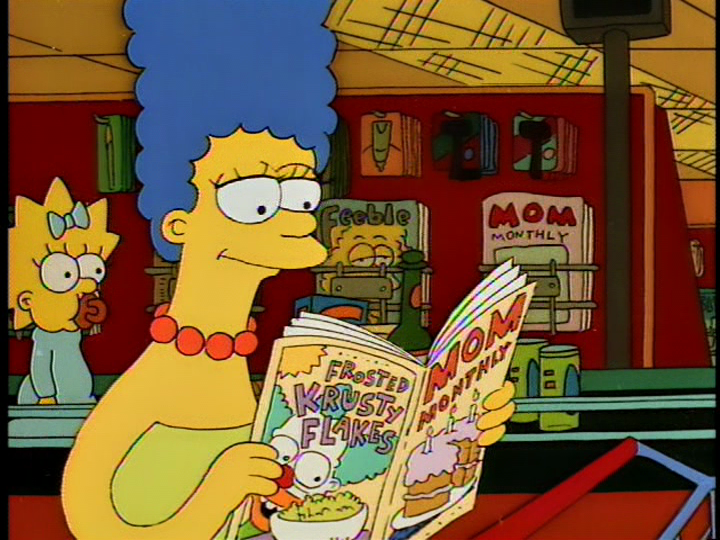 After the couch gag, it zooms out to lots of pictures of couch gags, reading "500". 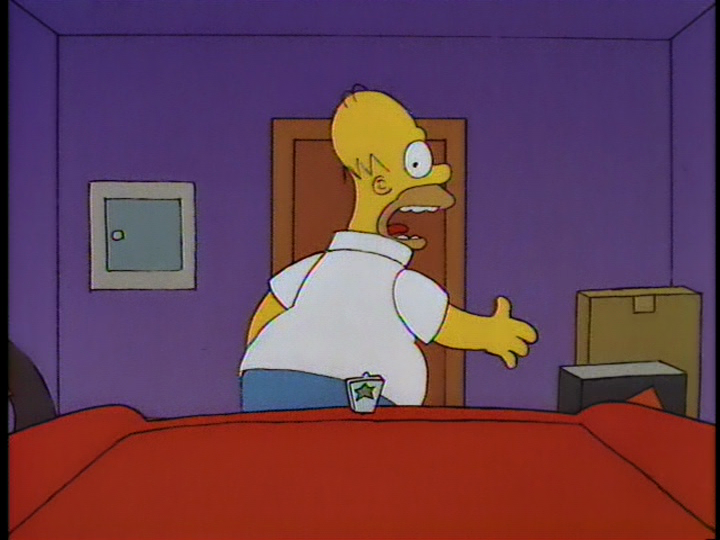 It breaks like glass, and Homer is seen choking Bart. 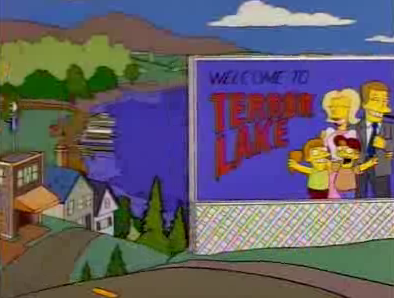 The opening sequence is the Guillermo del Toro parody from the episode, Treehouse of Horror XXIV. The opening sequence is the pixel art intro from the episode, My Fare Lady. 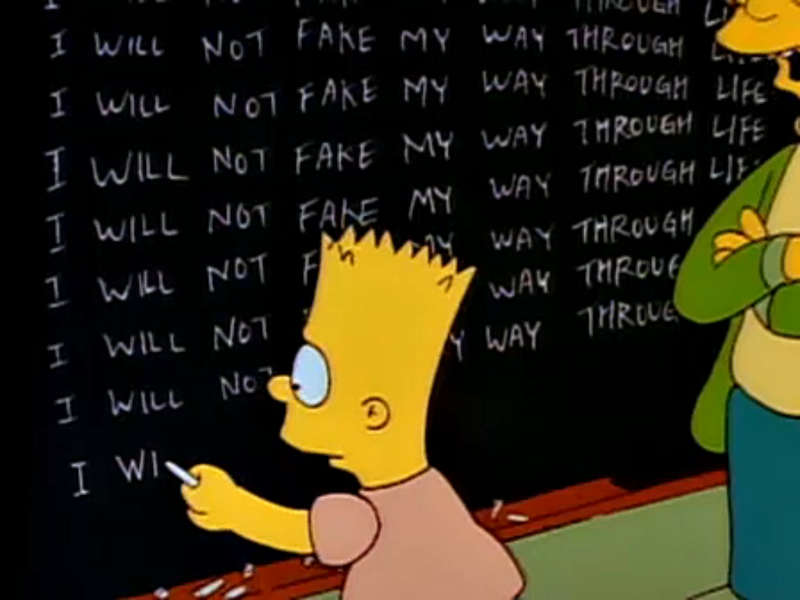 Mrs. Krabappel forces Bart to write "I Will Not Fake My Way Through Life" in "Bart Gets an "F"". 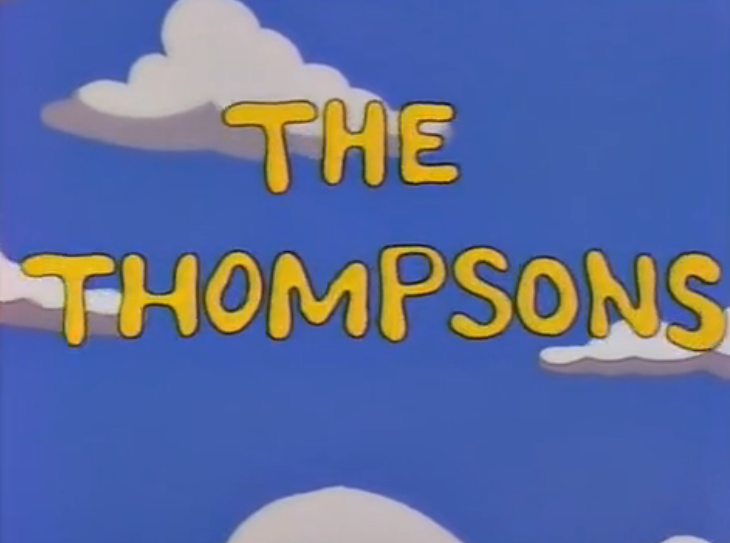 A short parody as "The Thompsons" in the episode "Cape Feare", when the Simpsons go into the witness protection program to avoid Sideshow Bob. 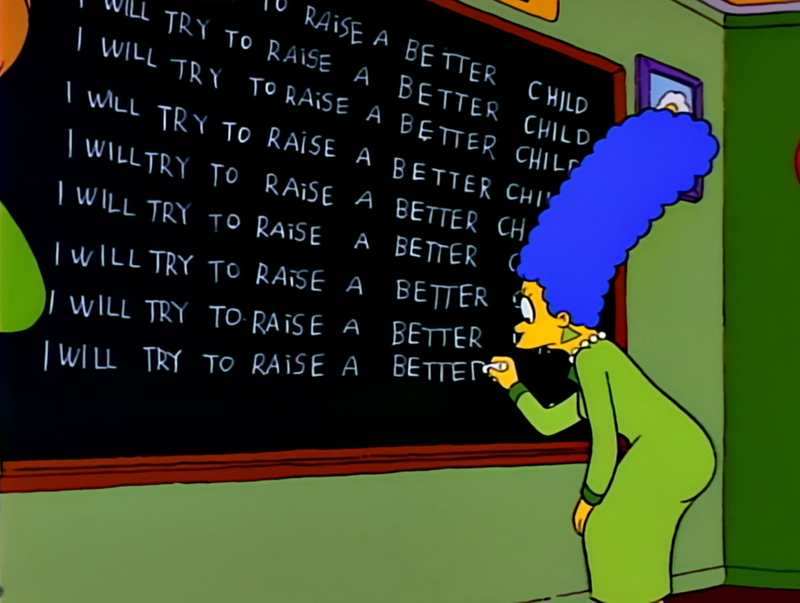 In a scene from "Itchy & Scratchy: The Movie", on Parent-Teacher Night, Mrs. Krabappel gives Marge a full report on how badly Bart has been behaving in school, and then forces her to write "I will try to raise a better child" on the blackboard. 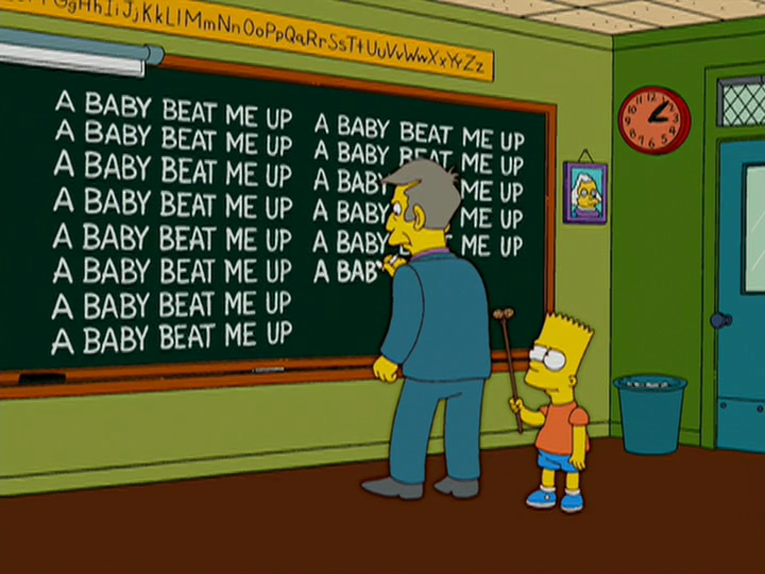 In a scene from "Please Homer, Don't Hammer 'Em", Bart forces Principal Skinner to write "A Baby Beat Me Up" on the blackboard. 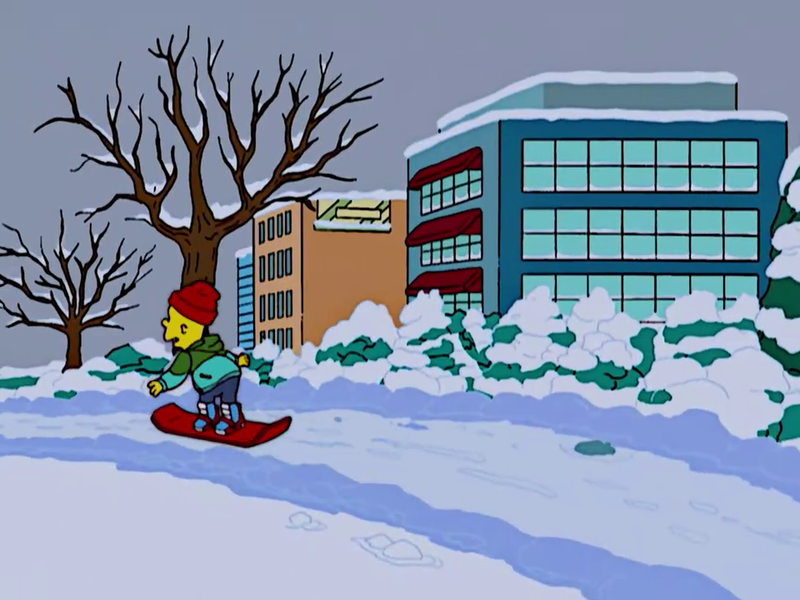 In the episode "Skinner's Sense of Snow", the students rebel and overpower Principal Skinner. 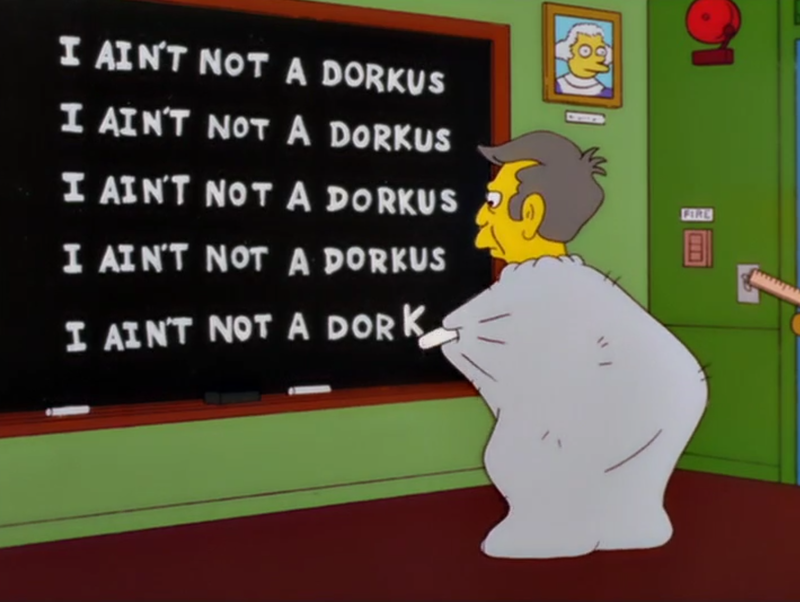 Bart forces him to write "I ain't not a dorkus" on the blackboard, over Skinner's complaints that the sentence is a grammatical nightmare and that he's getting a cramp in his wrist. 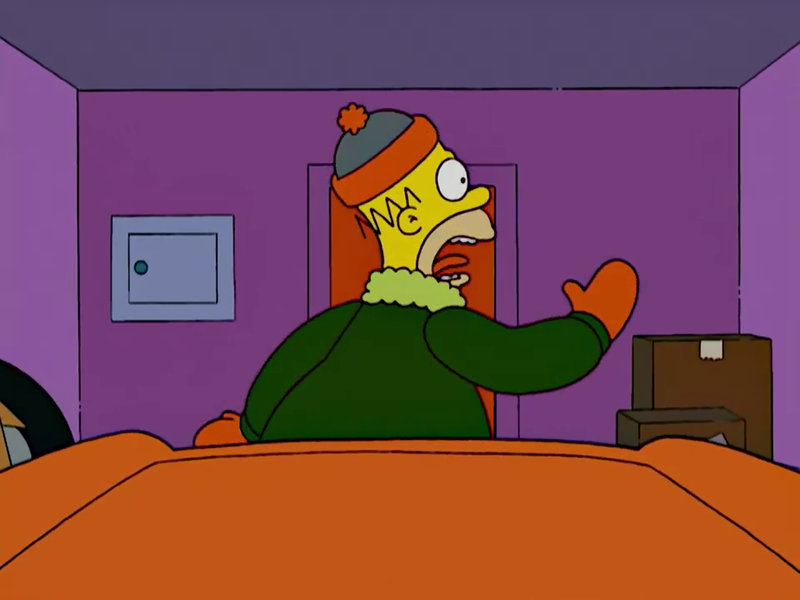 Once as "The Hurricane" in the episode "Hurricane Neddy". 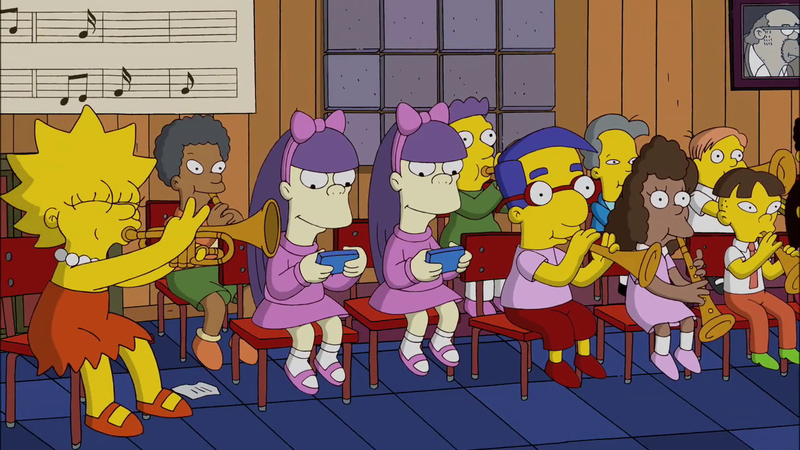 In a scene from "Simpsons Bible Stories", Bart is writing a chalkboard punishment in hieroglyphics when he hears Milhouse's horn being blown and leaves the classroom. 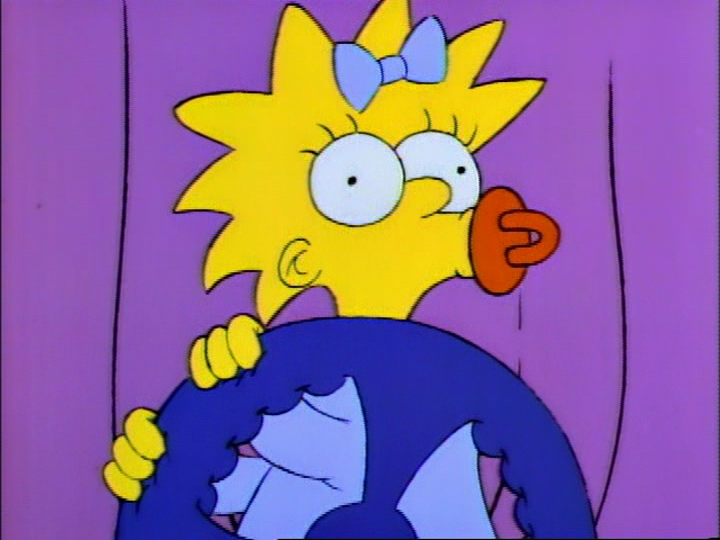 In a scene from "Lisa's Date with Density", Lisa receives detention for snickering at Nelson spraying Groundskeeper Willie outside. 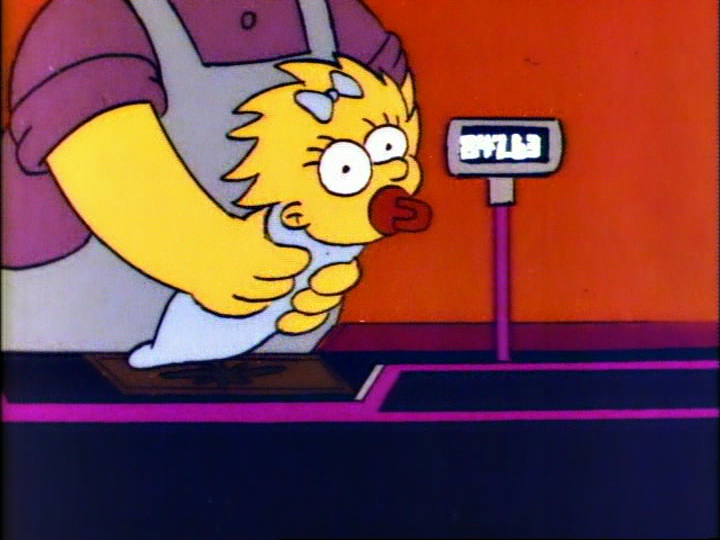 In addition to this, she writes "I will not be a snickerpuss" on the chalkboard. 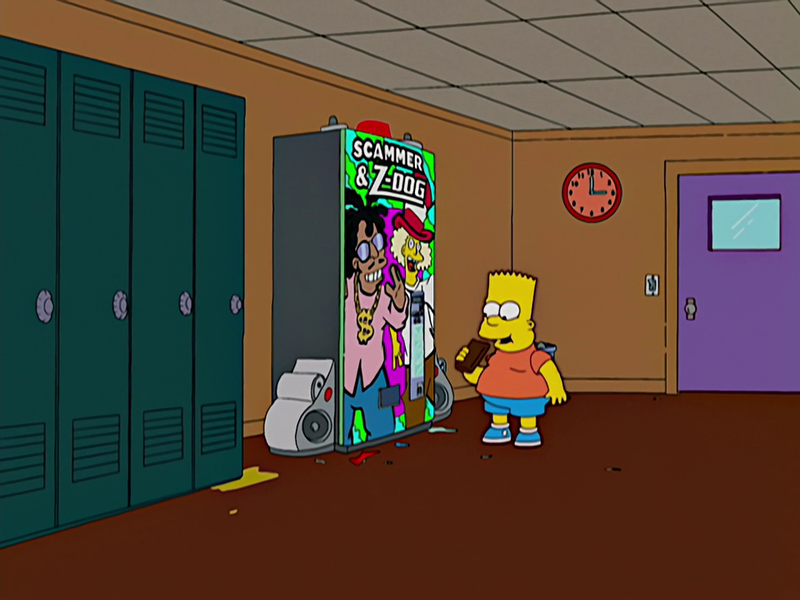 In the middle of "The Heartbroke Kid", instead of writing on the blackboard, a fat Bart is putting coins in the vending machine. 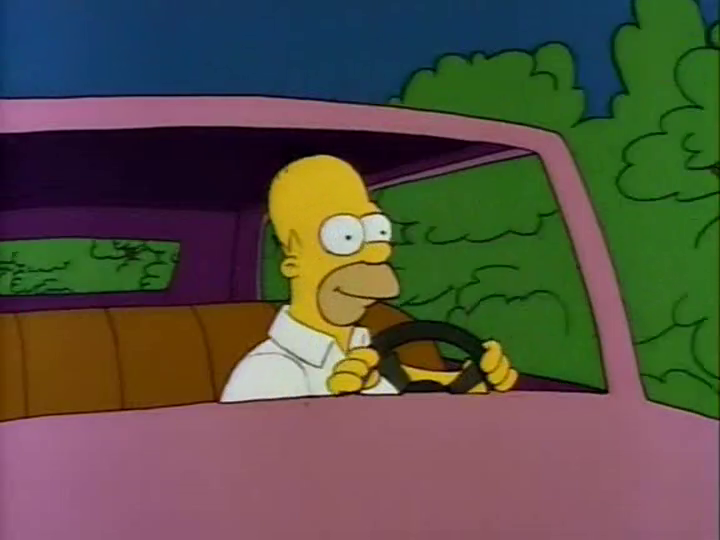 He then (due to his weight gain) cracks the pavement when he leaves the school, bends the lamppost, runs over pedestrians, hits Marge's car and sends it spinning off screen, and crushes the roof of Homer's car, squeezing him out, before finally stumbling into the living room and apparently having a heart attack. 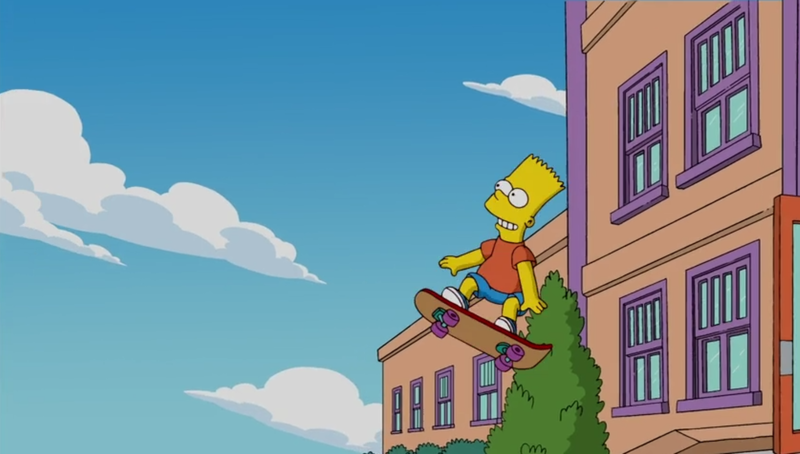 In "At Long Last Leave", there is a parody of the opening sequence after the Simpsons move to The Outlands: Bart spray-paints graffiti on the wall of a run-down building that resembles Springfield Elementary School, then rides a motorcycle through the wall, out the building and along the road to the family's new home. 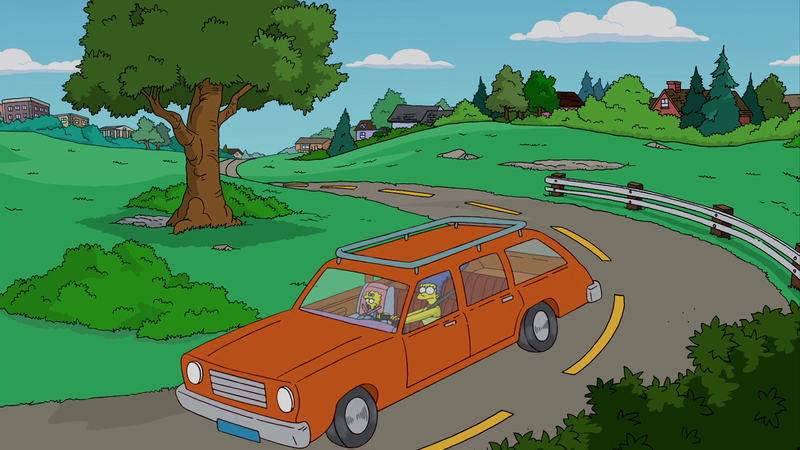 Homer arrives on an ATV; Lisa and Maggie in an ultralight helicopter; and Marge in a horse-drawn grocery cart (running over Homer in the driveway). 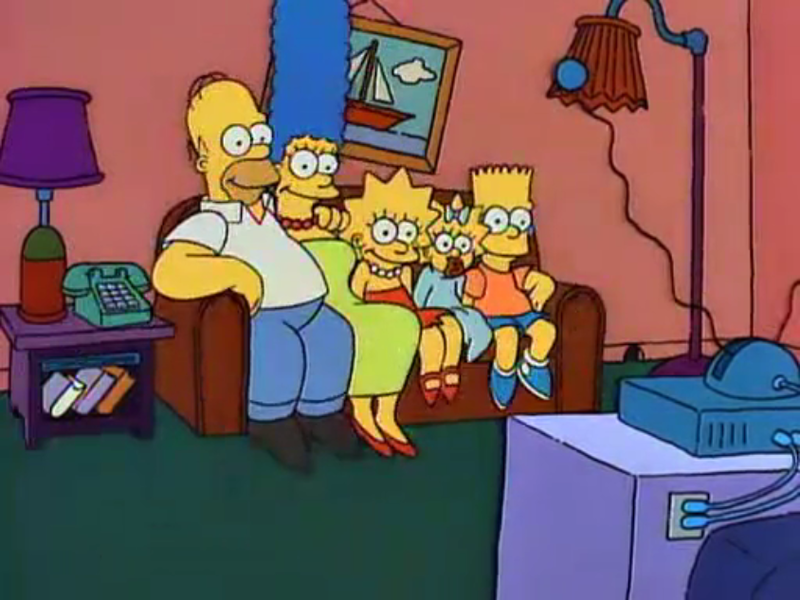 The family take their seats on the couch and watch a fox sleeping on a rock. 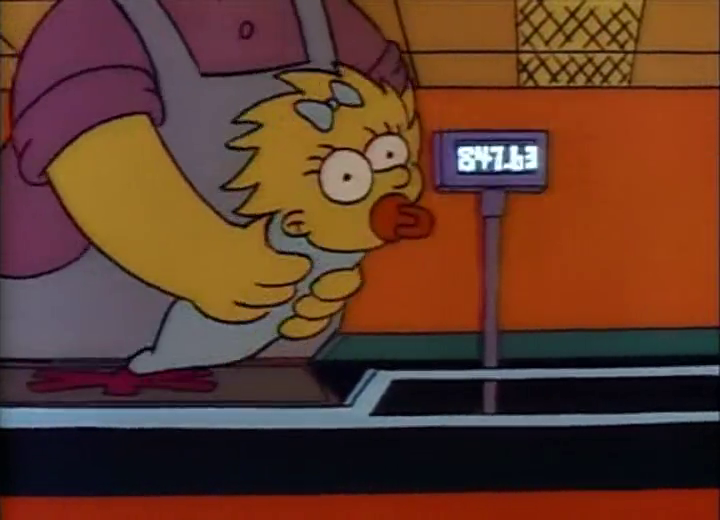 In Season 22, the cash register reads $486.22, for there being 486 episodes at the end of Season 22. 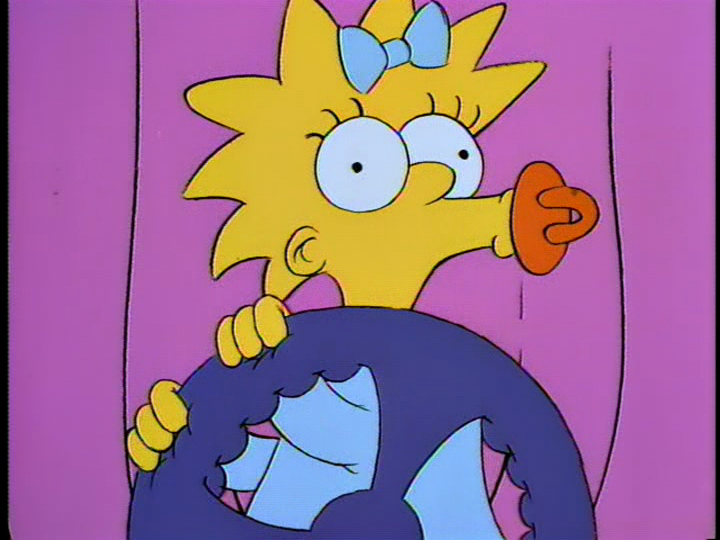 In the episode "Little Big Girl", Bart is awarded a driver's license, and a section of the opening sequence is shown with Bart at the chalkboard writing "So Long Suckers". 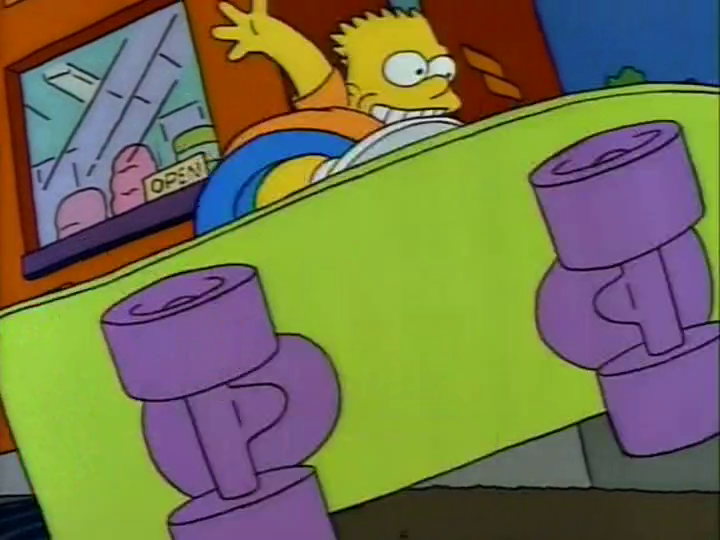 He bursts through the school doors in Homer's car, instead of on his skateboard, and speeds away, doing all the same gags as the opening sequence, but instead of nimbly dodging all the obstacles, he runs them over. 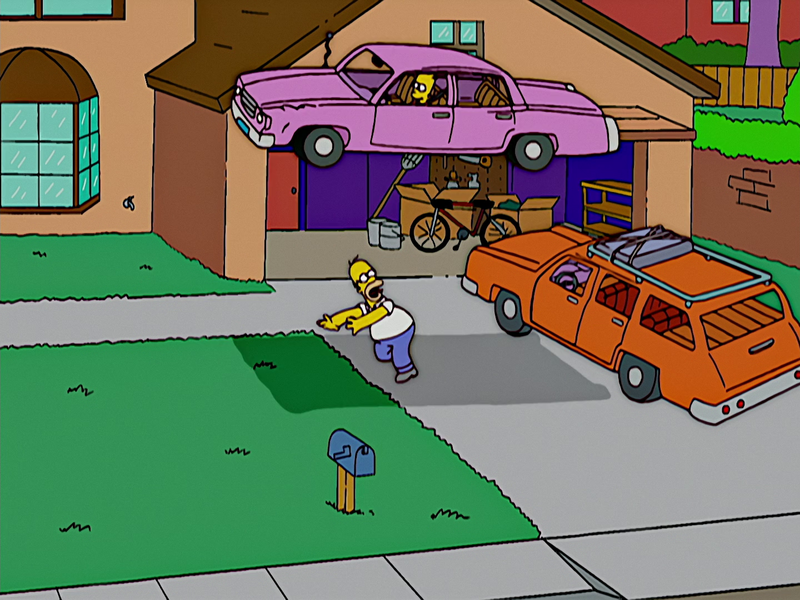 Homer then pulls into the driveway in Marge's car instead of his own and steps out to enter the house, when the other car lands on him, and Bart walks into the house. 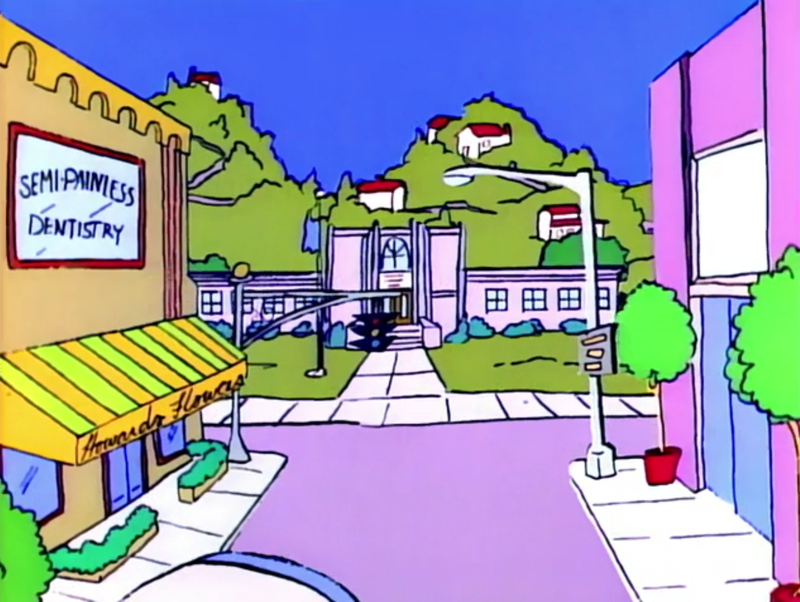 The HD pan shot was used as a mural in the eating area at Universal Orlando Resort, however Frank Grimes' grave, the mafia, God and the Devil are edited out. Modified on April 13, 2019, at 15:59.